So, when I am not flying in the Winter I am planning flights for the coming Flight Season. Ever since formulating my “Prevailing Wind Fun Flight Method”, it is apparent I must chart a good number of flights to the South each season. This is because for most of the Summer, in Kansas, the wind blows from that direction. 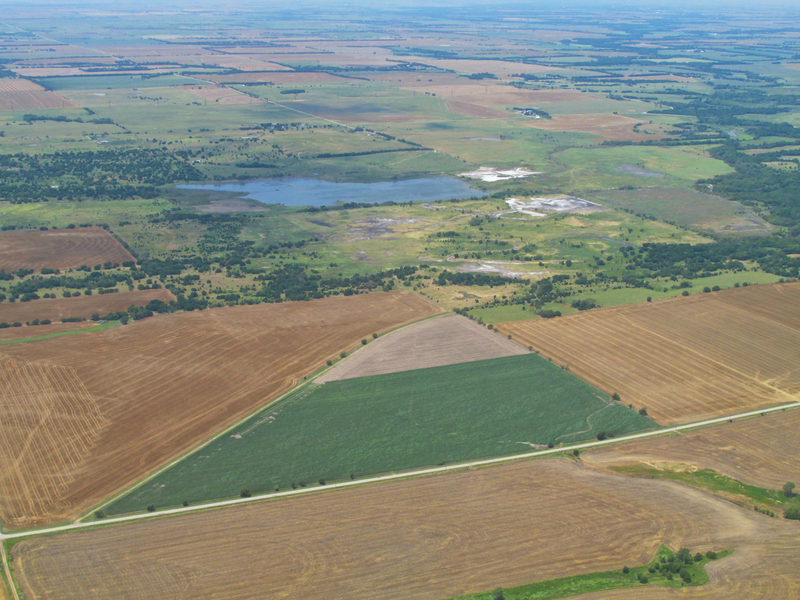 Two venues that caught my eye when surveying the map, were in Oklahoma to the Southeast of my home field Selby Aerodrome. 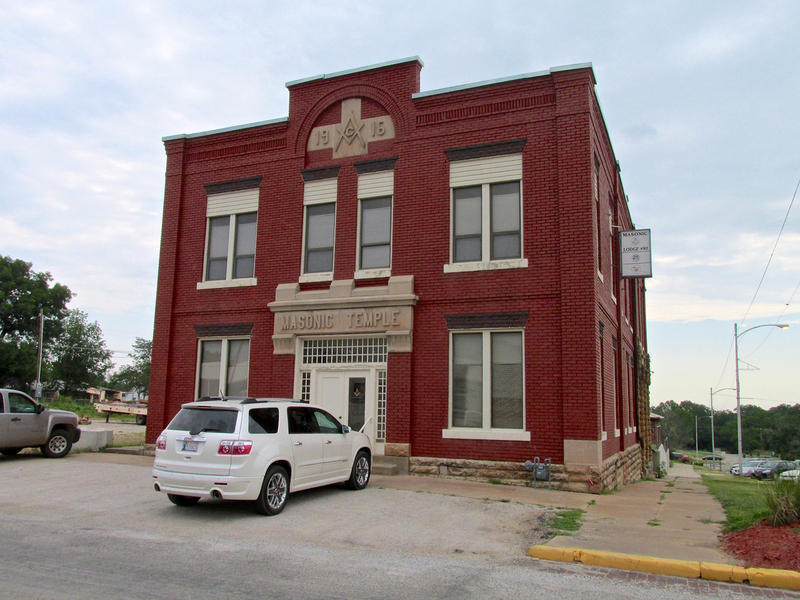 One was Pawnee and the other was Pawhuska. So, this story is about a flight to Pawnee. The next story will be about “The White Haired One“. Just After Sunrise. Time to pick up a 160 degree heading for Pawnee, Oklahoma. 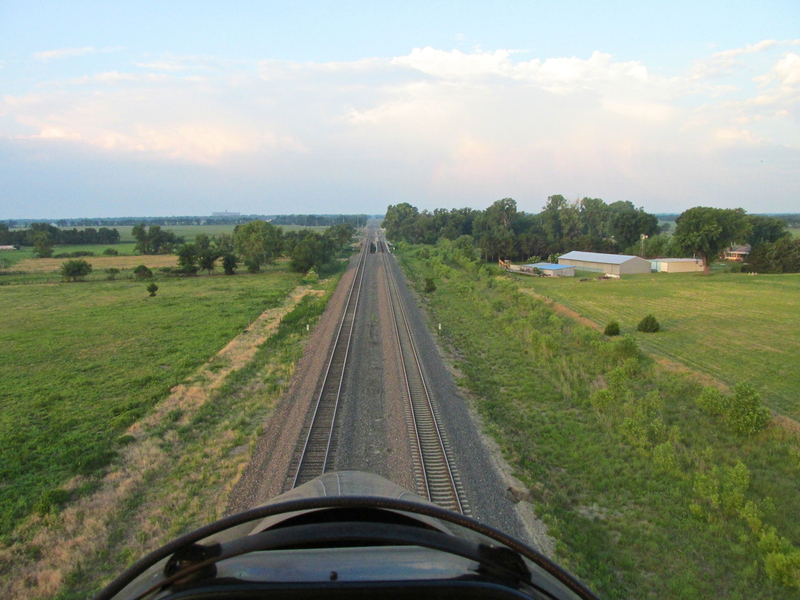 After passing high over the scattering of homes South of Selby, I dropped down and followed the railroad tracks for a while like the Barnstormers did in the 1920’s. 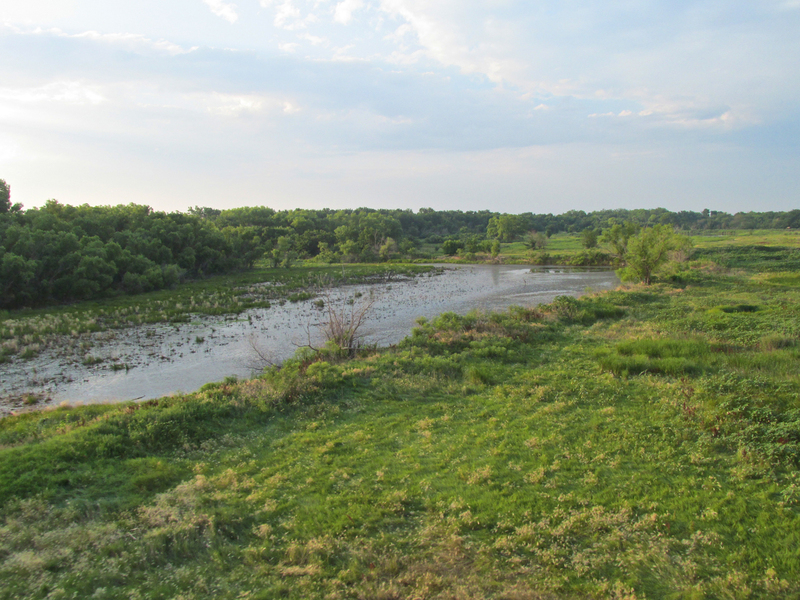 Nary a soul was stirring at that early hour as I hummed past the East Side of Belle Plaine, Kansas. 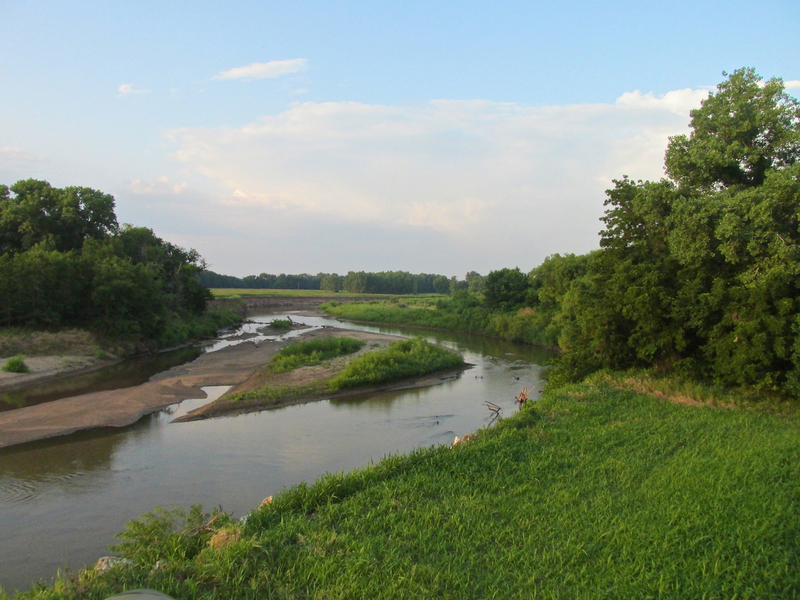 As the river widened I decided to climb higher. 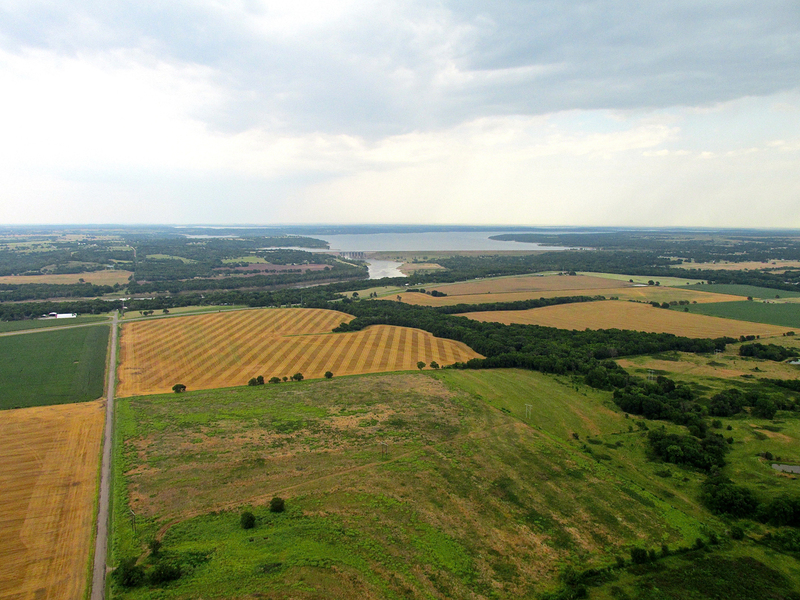 Then from the 400′ AGL altitude I was for the previous shot, I noticed this cut wheat field of many browns and yellows. 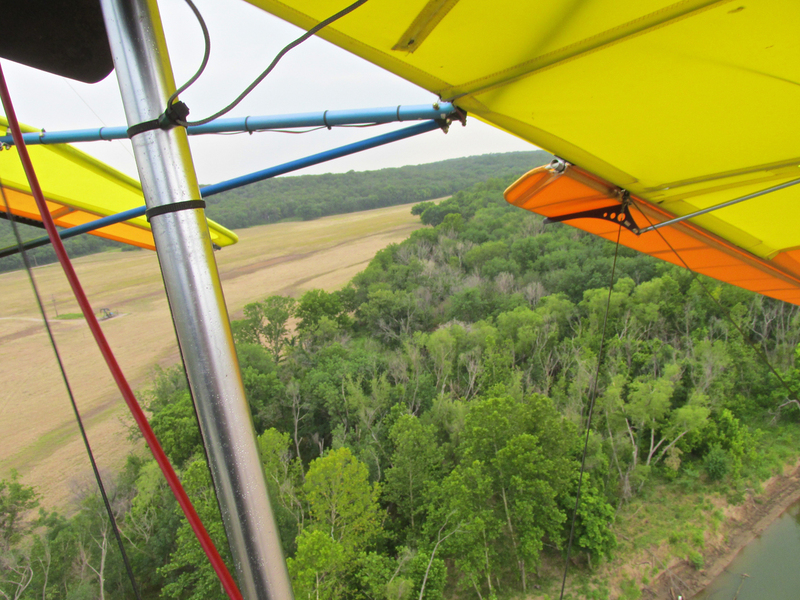 I dropped back down to Ultralight Flight Level 75 so you could see it, too. Suddenly this marsh appeared. Quite unusual for this area. Ahead I saw movement in the brush! Three deer had been laying low but could stand the sound of this big yellow bird no longer. All three bolted but I could only catch this one on camera. 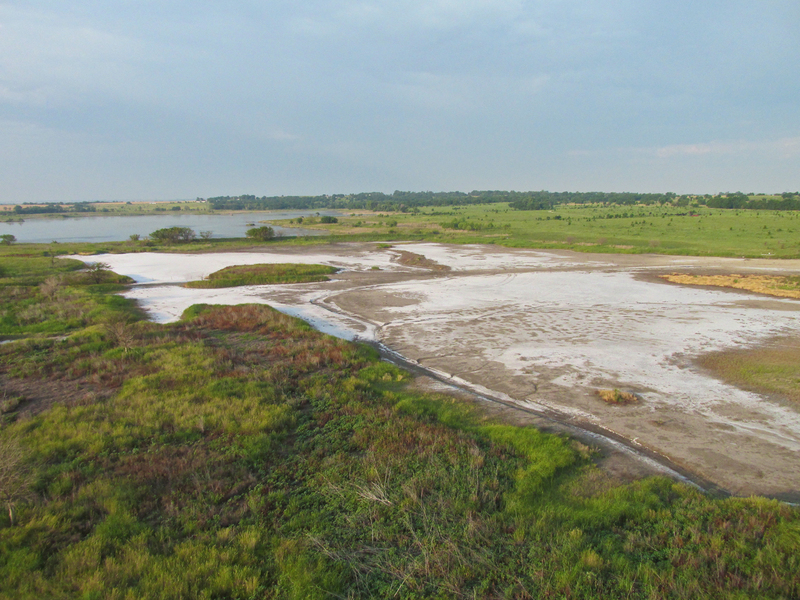 Shortly the marsh was interrupted by a small salt flat and then a large pond. Suddenly I topped a slight ridge and beheld the scene below. At first I couldn’t place it. 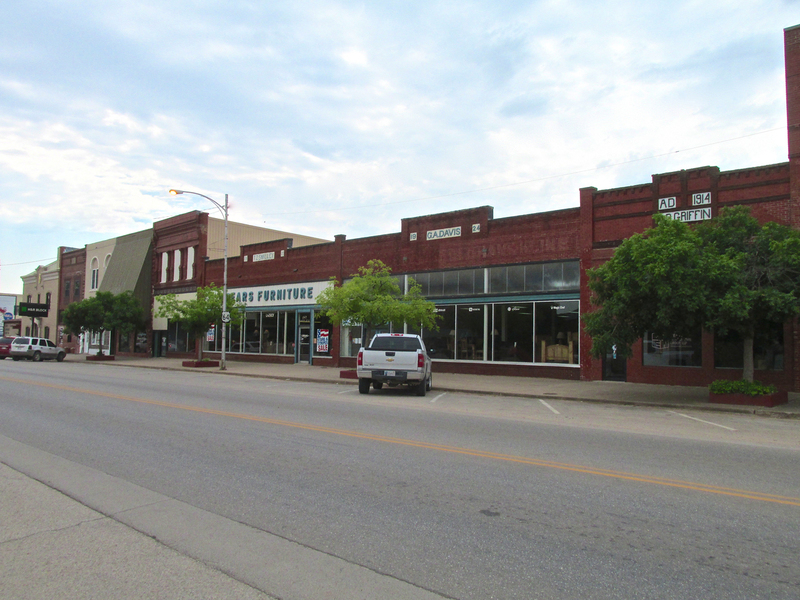 It was not laid out like a typical small town. 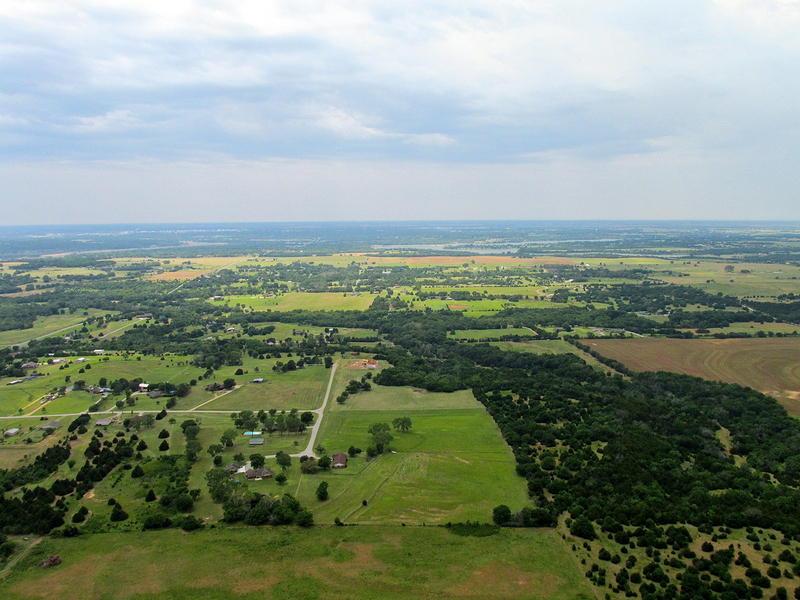 As I considered my time aloft, speed over the ground and reviewed the map in my mind, though, I realized it must be the outskirts of Ponca City, Oklahoma. 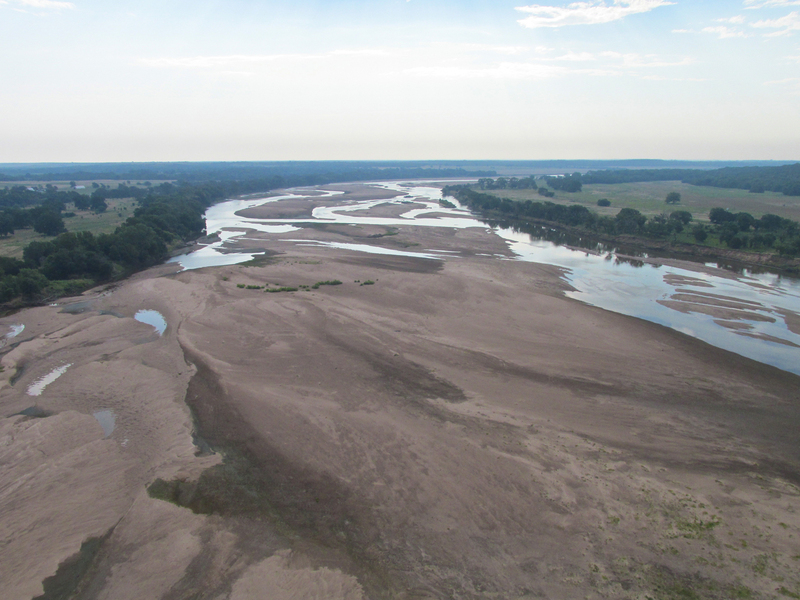 The scene below is 7 miles East of Ponca. 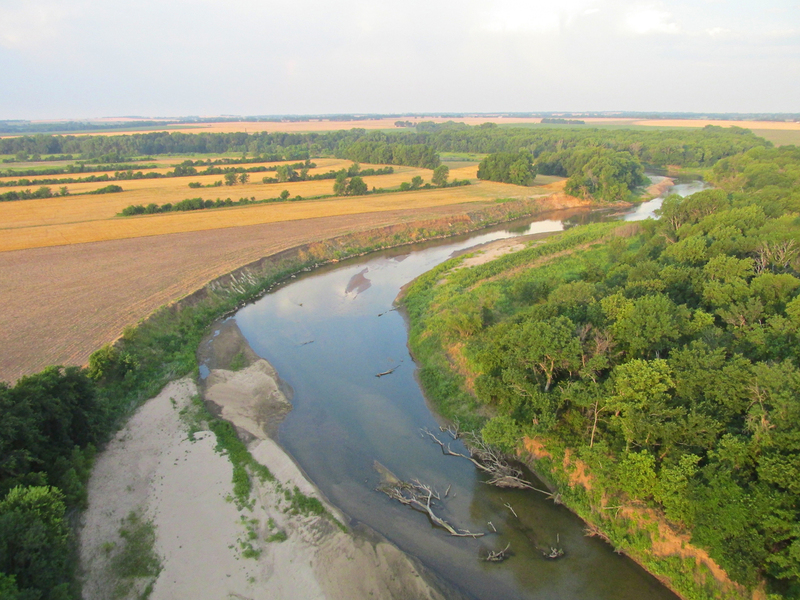 I had drifted about a mile East of my direct course to Pawnee. 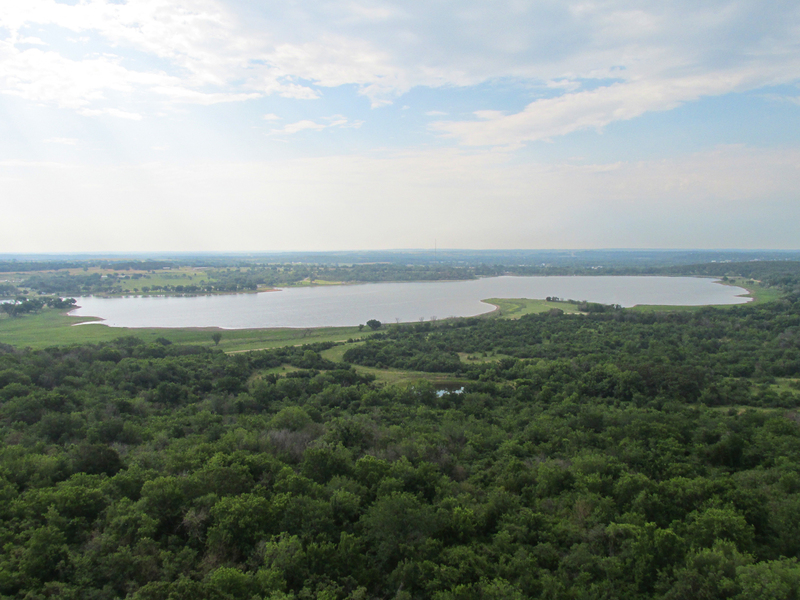 This put me over the small piece of Kaw Lake seen ahead. 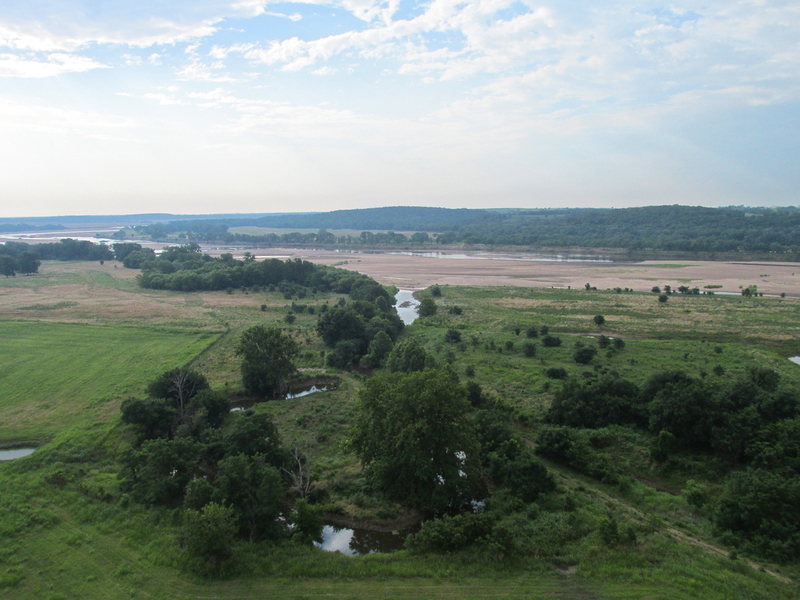 Ponca City is mostly hidden in the distant haze West of my postion after crossing the little leg of The Kaw. I am at 400′ AGL. 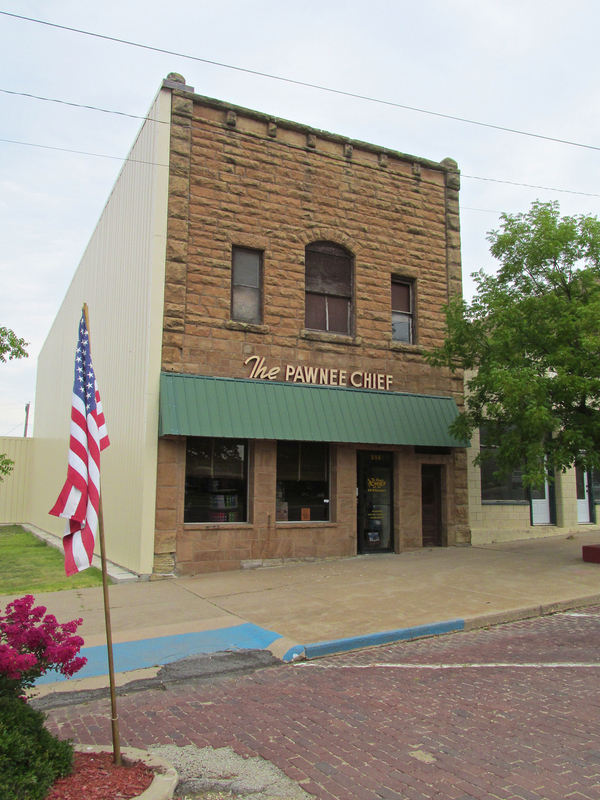 Now that I am Southeast of Ponca City, I know I will be spotting Pawnee before too long. 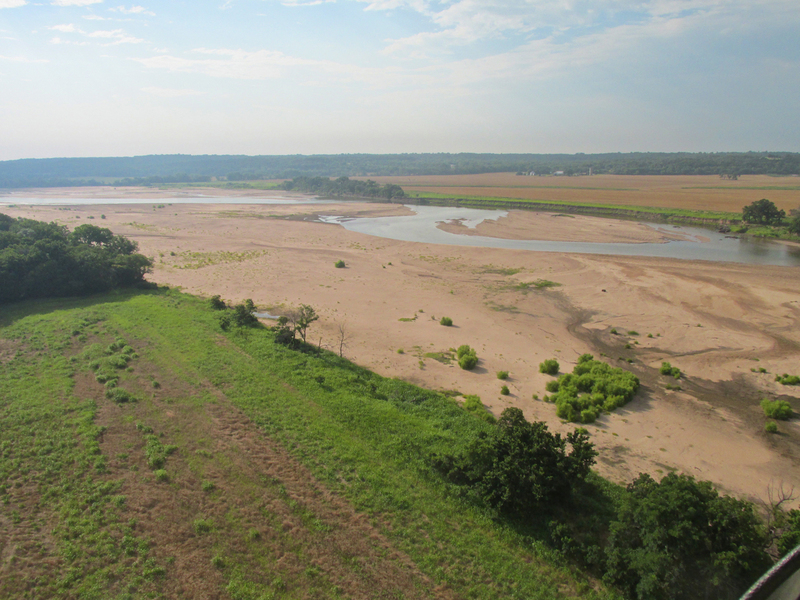 The Arkansas River makes a big “U” turn to the West Southwest here so I will have the great fortune to cross it twice. The humidity that time of day in Pawnee was recorded at 68%. I think the humidity was much higher over the river. It wasn’t quite this dark to the eye when the shot was taken. The camera was having trouble dealing with the brightness of the sky and overcompensated by darkening the river area too much. These two had just waved at me. They were the only people I had seen in hours. My heading was Southeast. Which is the left part of the horizon shown here. To the Southwest (right) you can see rain falling in the distance. I am at 75′ AGL. 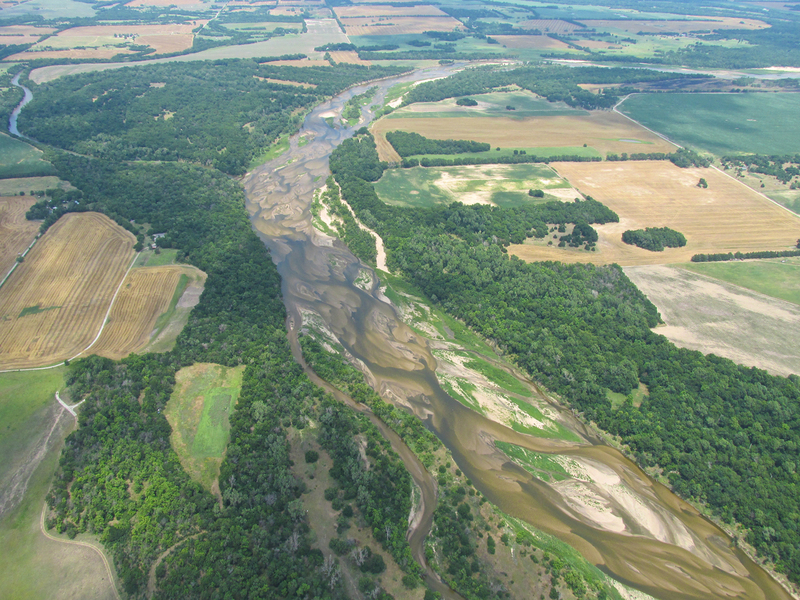 Again the Ark River winds under my course. Some high ground between the “waverings” of the river. Then I cross it again. The sun pops out for a moment. Climbing again over some high ground next to the river I see this nice hacienda with its own lake. 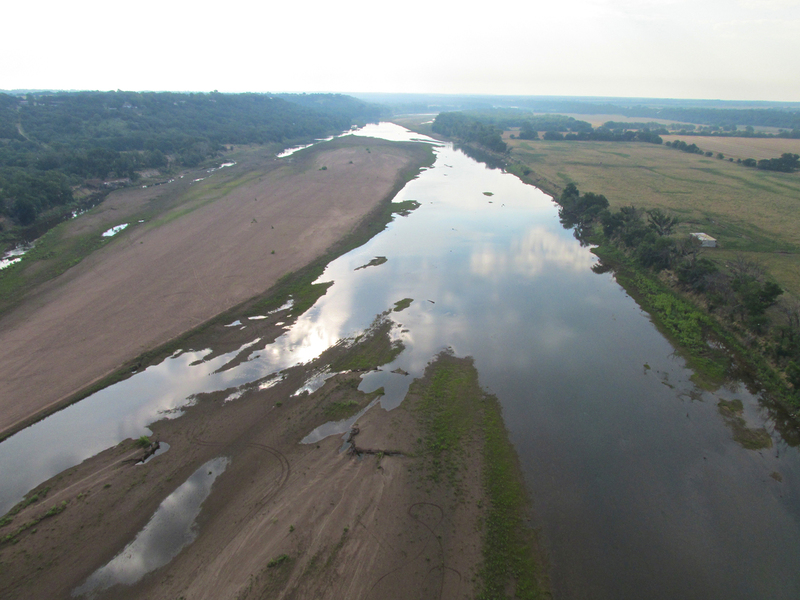 When charting my course, I was supposed to cross the Arkansas River twice. By this point in the trip I had crossed it four times. Bein’s how I don’t have eidetic memory, I wasn’t sure what that portended regarding my arrival in Pawnee. I decided to land in a fallow wheat field to check my map. Upon looking at it, everything was fine. I had been off course to the West only 1/4 mile and that was enough to put me over an additional bend in the river. 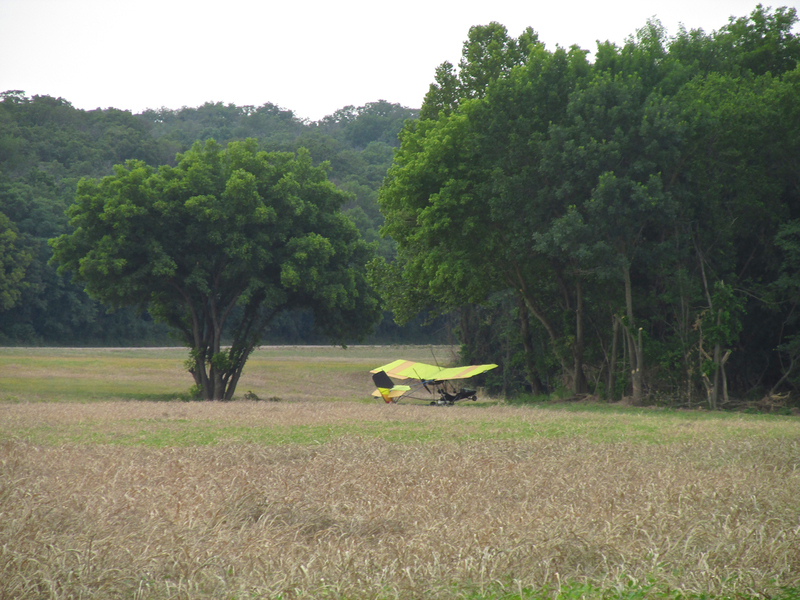 Note from Brian to The Sky Surfer: When landing out in the country, from now on, take a pass on the fallow wheat fields. Stick to the mowed hay fields, oil field roads, pickup trails, county roads, etc. 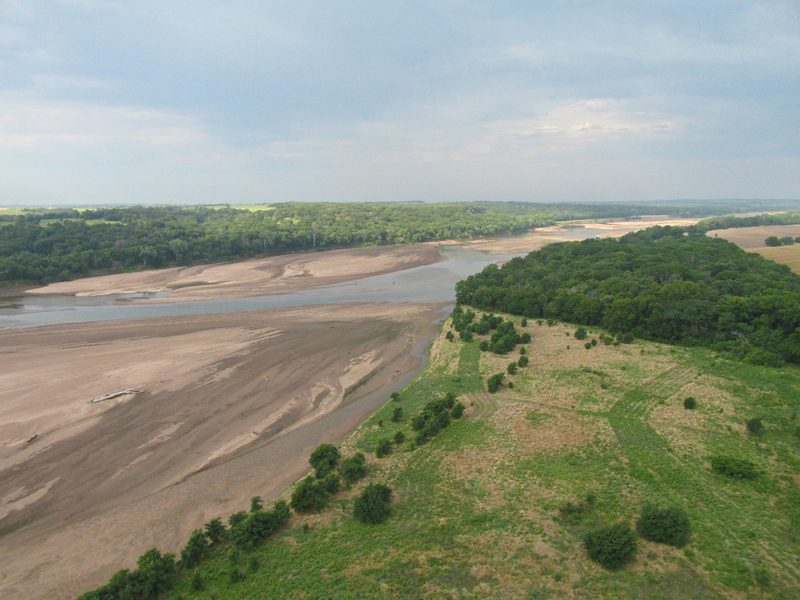 In both pictures we are looking East Northeast. Crossing the Ark River yet again, I liked the way I could see both the river and the sky. On the other side of the river I saw this workover unit. 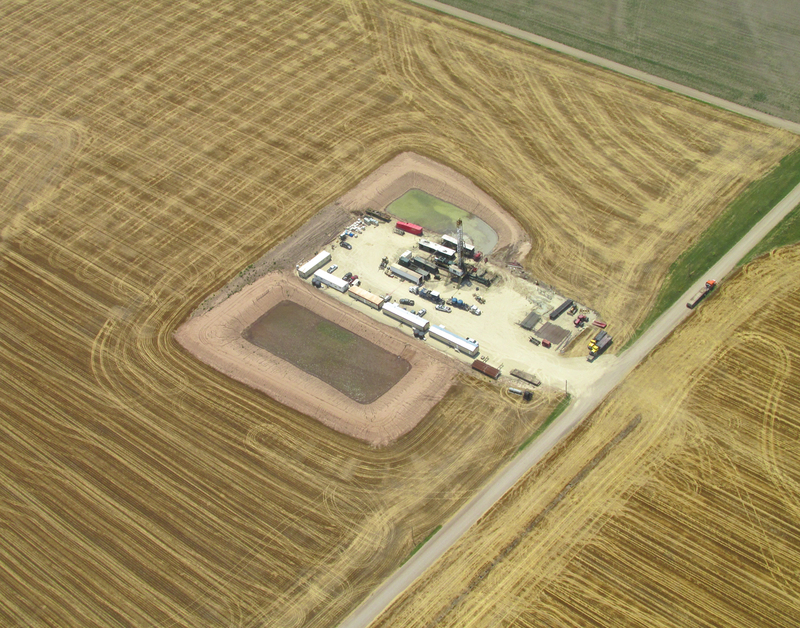 Units like this are employed to re-open a plugged oil well or to solve problems with an operating well. In the oil business they are generally a good sign because wells are only “un-plugged” when the price of crude has risen high enough for this “additional expense to make sense”. No People. Only these cattle were around. 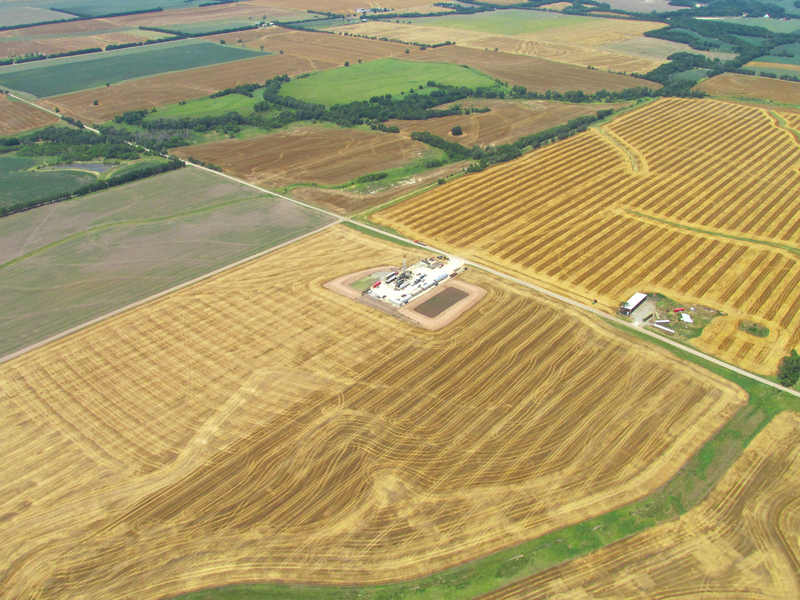 When I landed in the wheat field I was only 12 miles from Pawnee Airport. 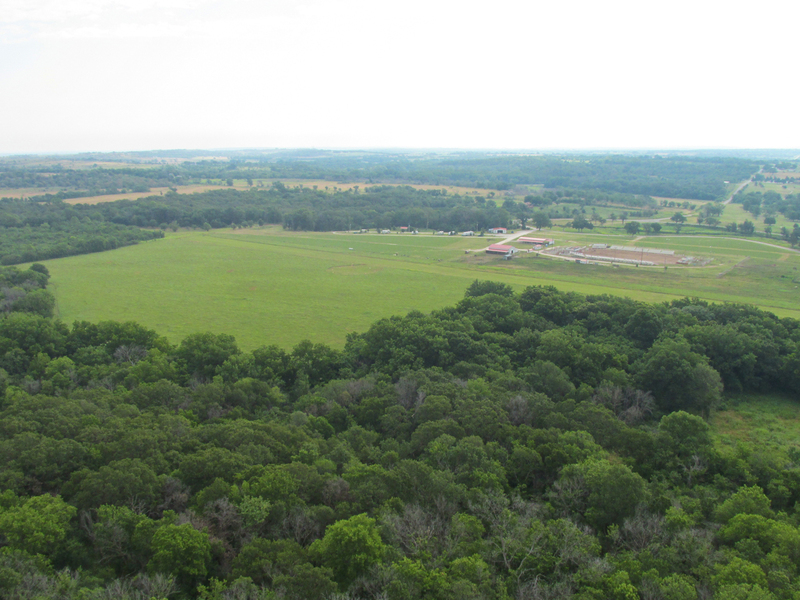 It is more hilly and wooded in this area, so visibility is more restricted when flying low. I knew I should be seeing Pawnee Lake soon. Suddenly I did, and knew I would be entering the airport traffic pattern due North of it. 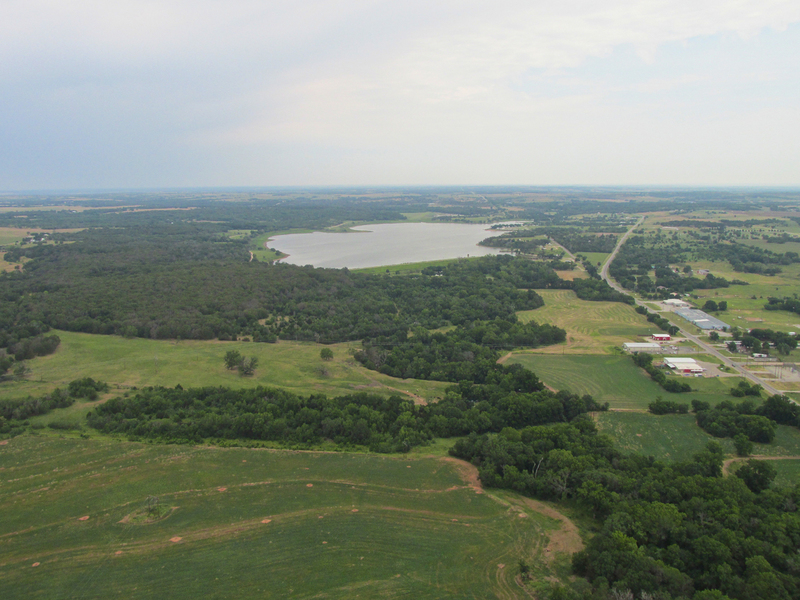 Pawnee Lake from 600′ AGL looking South. 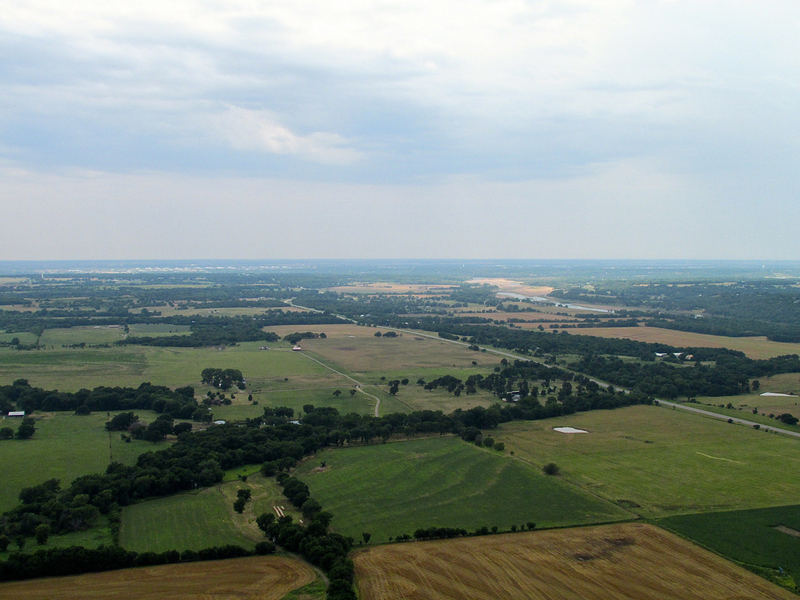 Moments after seeing Lake Pawnee, Pawnee Municipal Airport appeared under my left wing. 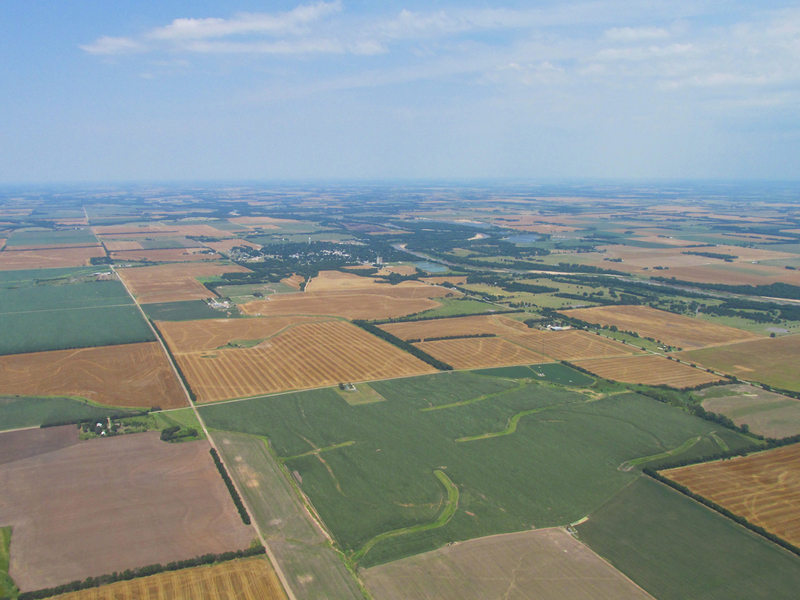 I took this shot as I passed over the field to enter the Downwind Leg for landing. 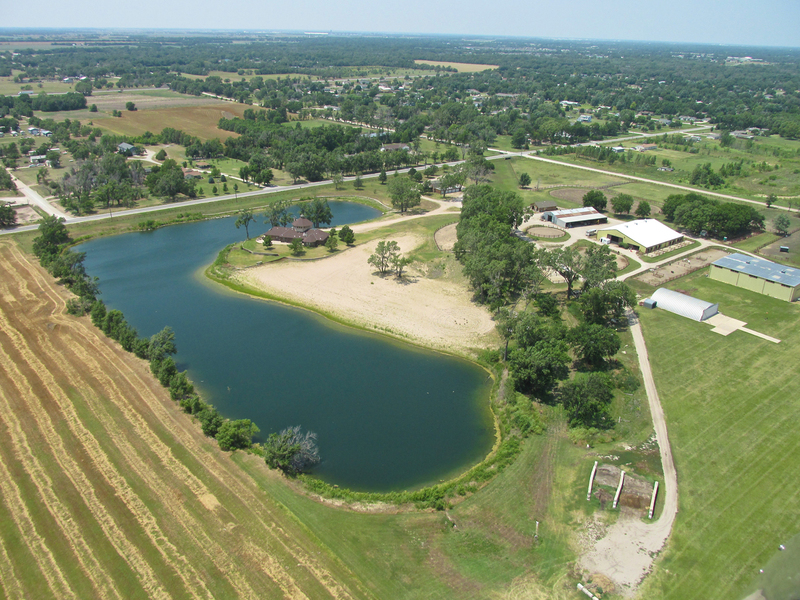 The Pawnee Lakeside Arena has taken the place of a number of hangars that used to be in that spot. 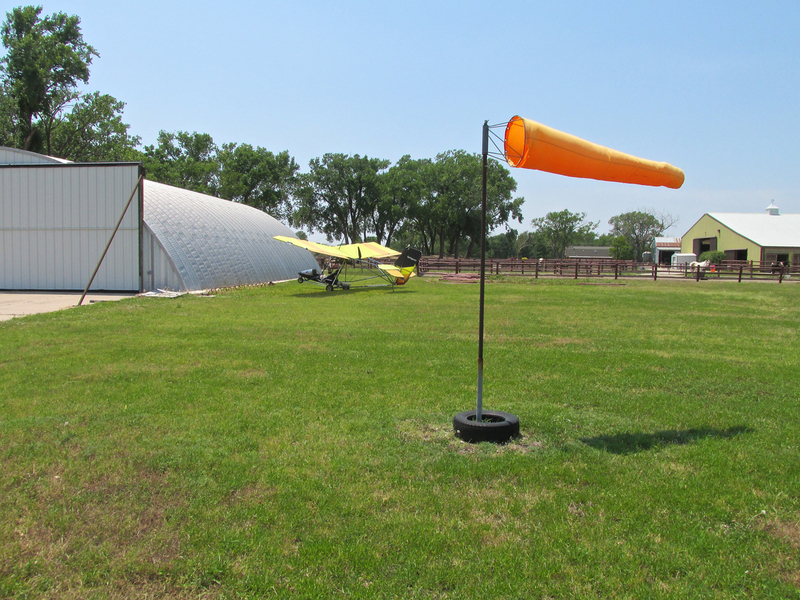 After rollout I pulled up next to the windsock to tie down. I snapped this shot looking East. It was very quiet. Nothing and nobody was moving. When planning the flight to Pawnee I calculated a 3 mile walk into town. My general method is to carefully tie down the aircraft, unstrap the two empty gas tanks I keep behind the seat, grab them and some Havoline 2 stroke oil and walk into town. The first gas station I encounter, I ask the proprietor if I can leave the tanks and oil there. Then I set out to see what I can see. Wind on the surface was very mild so I only tied the tail down. 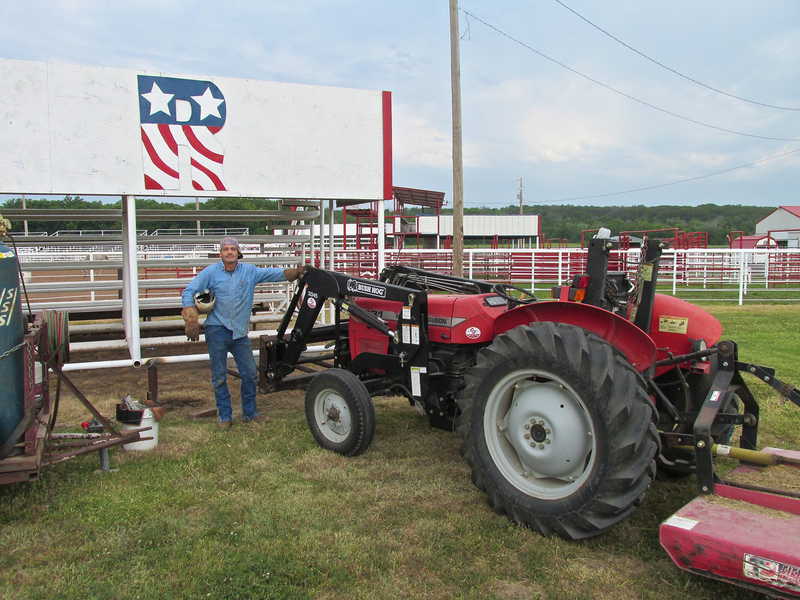 Seeking a short cut to town, I headed through the grounds of the Rodeo Arena. There, working to increase the height of the grandstands, was Welding Contractor Tom Tisher. Tom had been busy at work and did not know I had landed. When he saw me walk up with cans in my hands, he thought I had run my car out of gas. I could see he was busy trying to get some hot work done in the morning before temperatures rose that day. After briefly explaining what I was doing, I pointed in my intended direction of travel to see if he thought it was a good course. 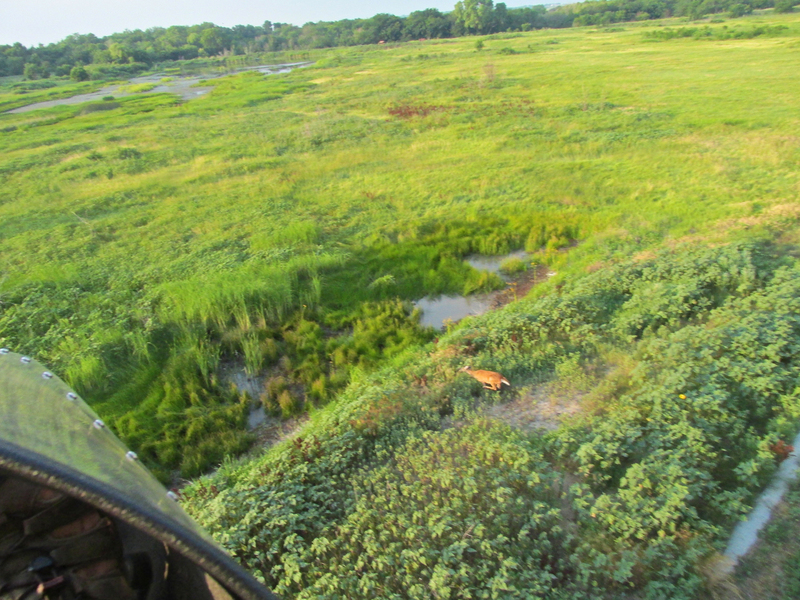 He pointed a little to the right of where I was going so I would hit the foot bridge over the creek. 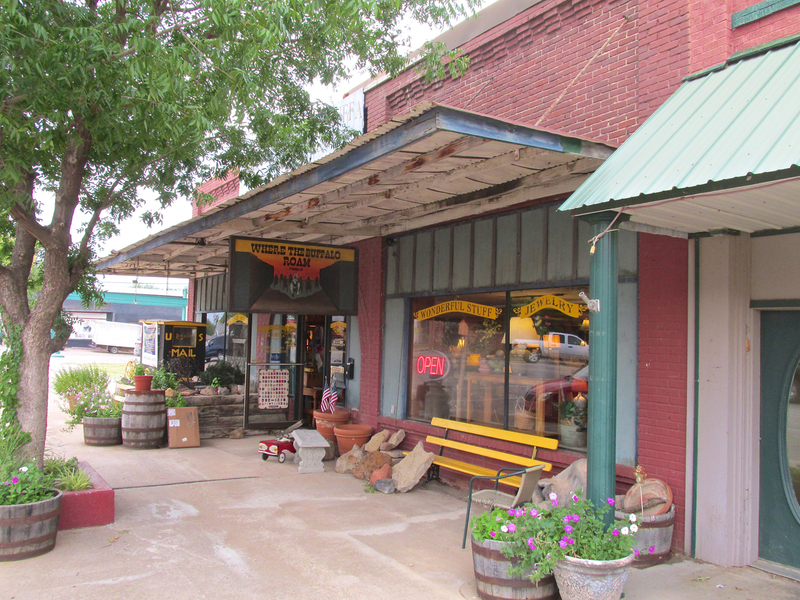 Then he gave me a great tip of another town in Oklahoma I should fly to (Cleveland, OK is now on the list…). Tom Tisher – hard at it on a Saturday Morning. Within two minutes my pace into town had accellerated to 50 mph as I took my place in the passenger seat of Tom’s Cadillac. Tom gave me some observations about Pawnee and in about three minutes we were at the first gas station/convenience store. Tom grabbed a soft drink and said he had to get back to work. I thanked him for the ride and said I would check in on my way back if he was still working at the arena. 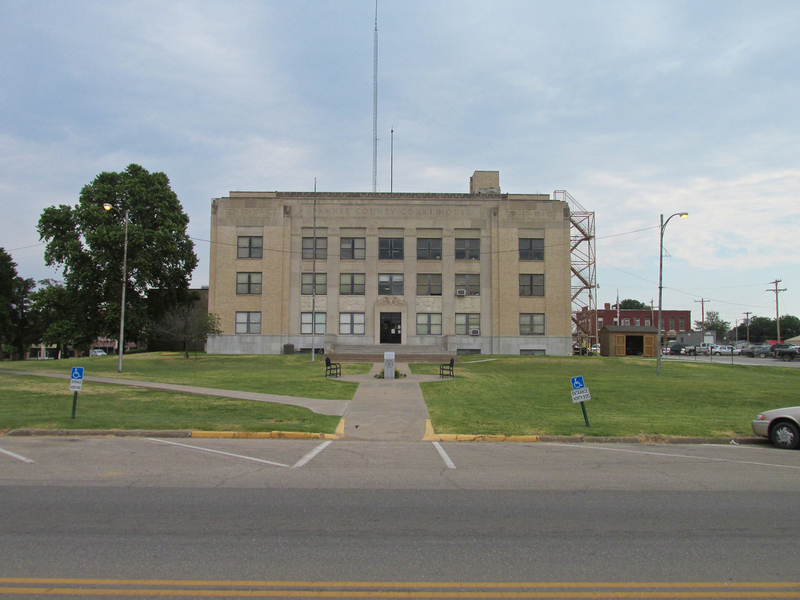 Pawnee is the county seat of Pawnee County. There are about 2,190 people living there. Everyone was pleasant and things seem to be going fine there. The small towns I fly to are arranged around a “town square”. Typically that is where City Hall, the Library, the Police Station and the Bank are. Depending on the layout, my path might take me through residential housing. I cover some of that but always head for the town square to include it in my photos. As children most of us were taught the story of “The Three Little Pigs”. On the surface, merely a primer on construction codes, the real moral of the story is deeper. It teaches the values of hard work, planning, prudence and permanency. Evident in the architecture, I see those virtues were present in the ancestors of those now fortunate to reside in Pawnee. 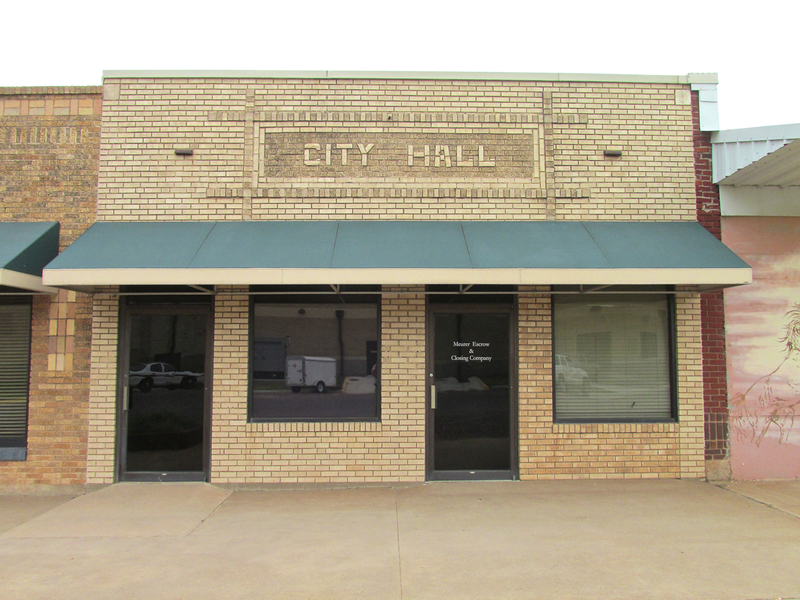 Since the people of Pawnee have decided to maintain and embrace these solid, old buildings, I surmise they embody the same traits. The Pawnee County Courthouse will not win any awards for art but it definitely conveys seriousness and solidity. Behind the Courthouse is The City Square. 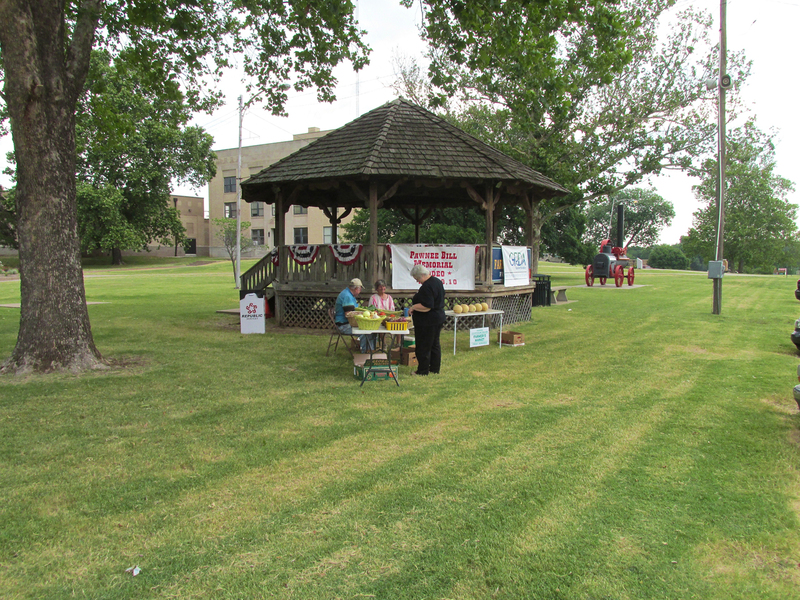 This one is “park-like” with a band gazebo and memorials to war veterans. I’m going to put this event on my calendar for next year. 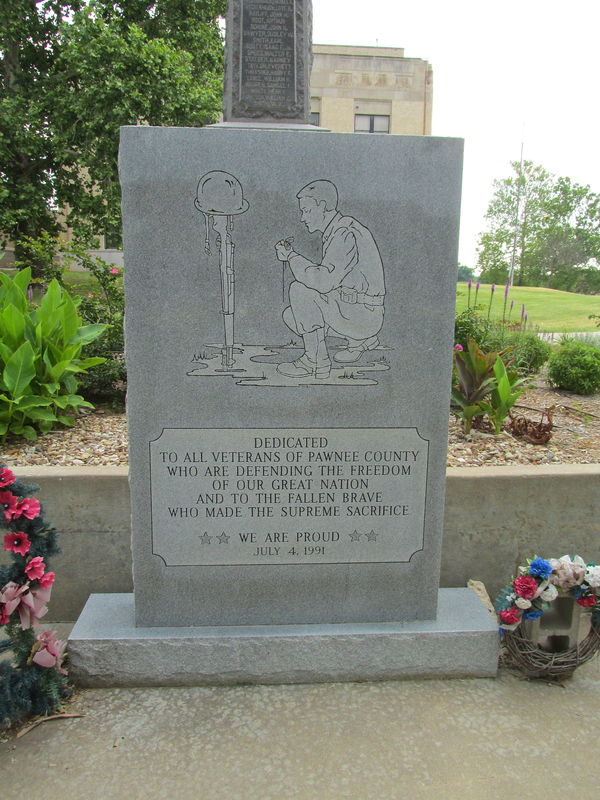 People of Pawnee are proud of the sacrifice many of their men made in World War II and Korea. 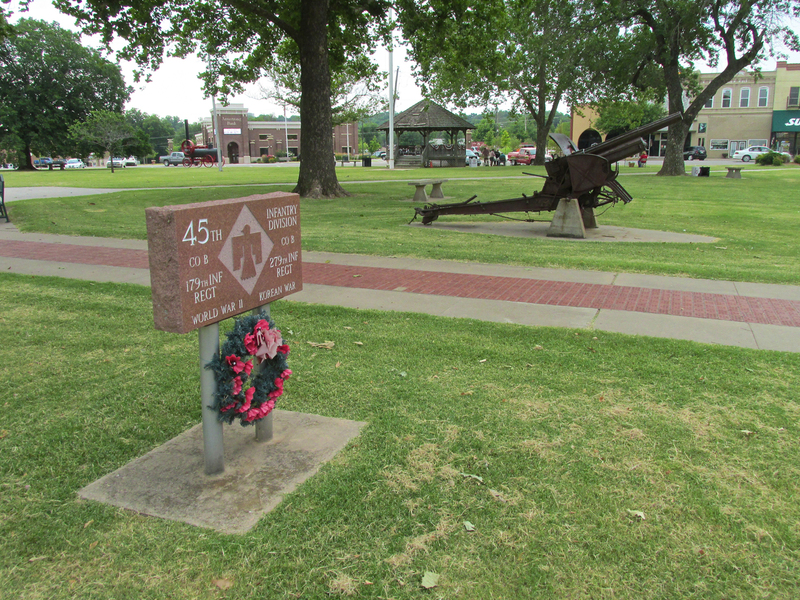 When I saw the memorial stone below, with the name 45th Infantry, I already knew of this unit’s fame. Growing up I read a constant stream of books and magazine articles about the battles of World War II in the air and on the ground. The 45th, known by their “Thunderbird” patch, fought with distinction against the Nazis in Italy and France. …I moved in close so you could see the entrance. 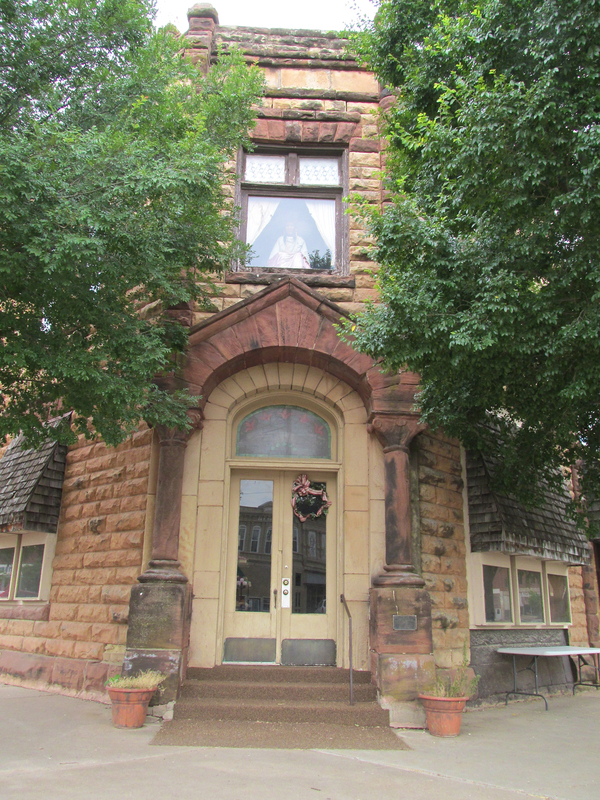 A salient feature I noticed on the facades of many of the buildings in downtown Pawnee is their “Date Stamp”. As I stated earlier, I am impressed that people made a statement with their buildings. 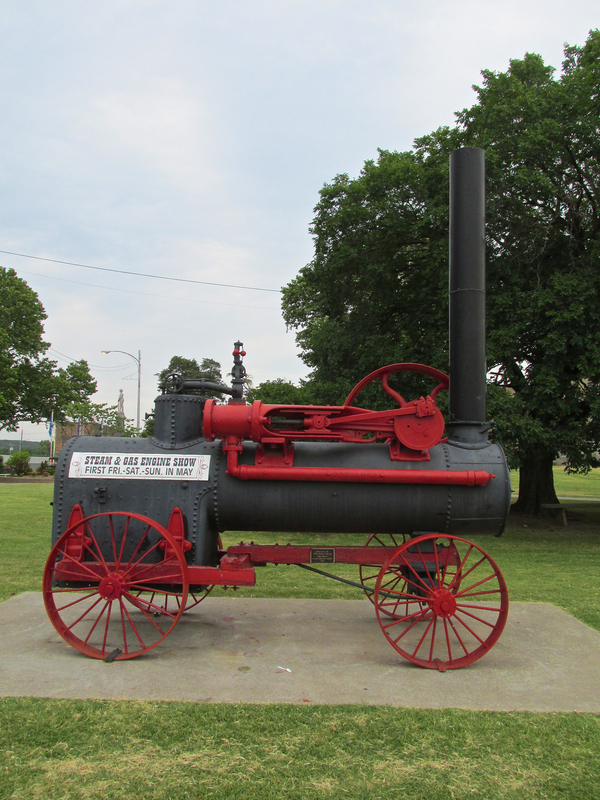 These are monuments to their culture of industry and hard work. They call out and should prod our era. 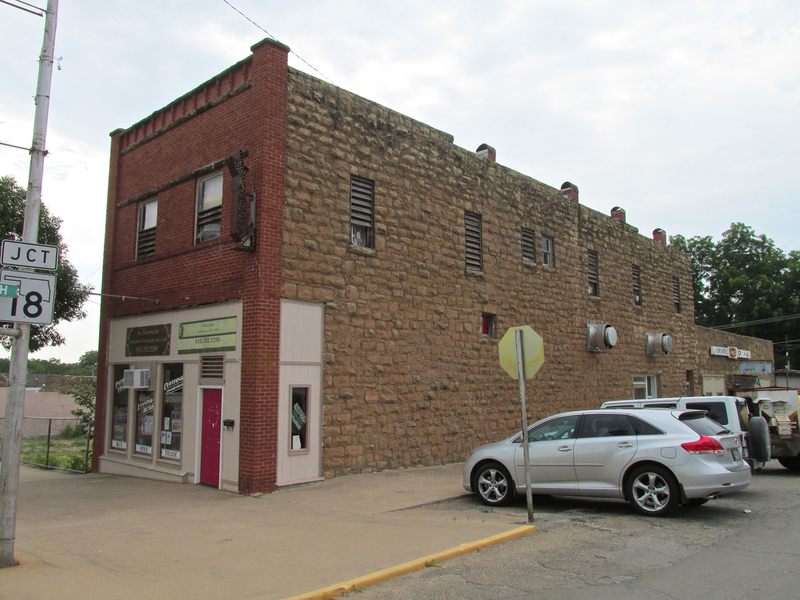 I believe the builders fully expected someone like me to look at the stone and brick edifice below – 103 years after it was built – and talk about how impressive it still is. No longer City Hall, this signage method is quite creative. The tenth time I looked at this picture I finally realized the backing for the Police and Fire Departments Sign is a section of old style fence. Of course we should expect The Mason Building to be made of brick and stone. After touring downtown Pawnee it was time to return to the gas station and fill my two gas tanks to carry back to the MXL. The sky was still overcast. 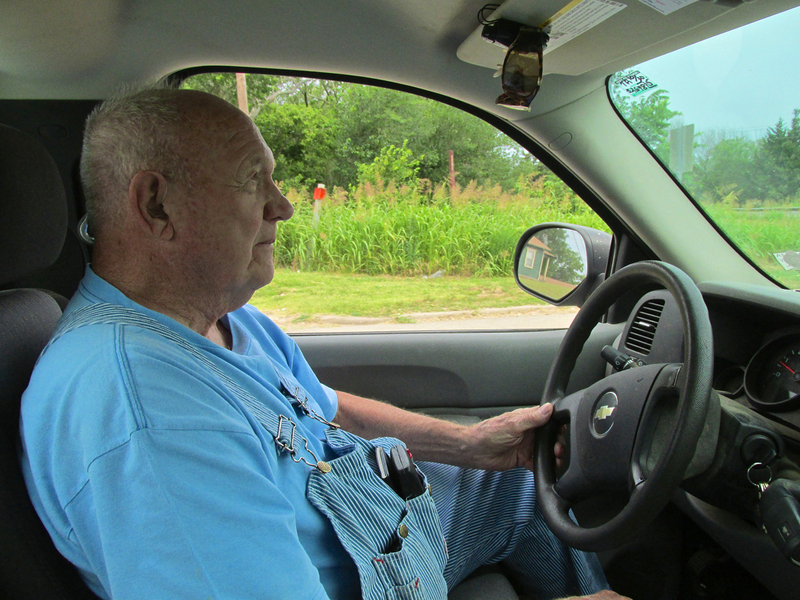 As I approached the station I noticed two guys in bib overalls talking by a pickup truck. While talking with his buddy, the one in the blue shirt seemed to be interested in what I was doing. About the time I was tightening the caps on my now full gas tanks, the one buddy drove off. I approached the one who had been watching me and introduced myself. He said his name was Les Crocker a retired plumber/electrician. I marveled at his “dual citizenship”, how different the professions are and that I had never heard of anyone performing both trades. 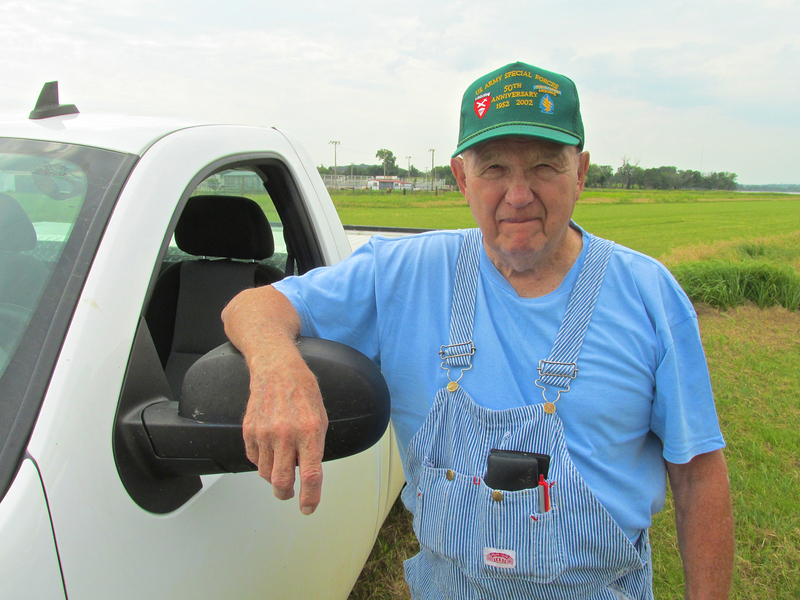 Les concurred and said it was very unusual but really helped him stay busy over the years in this rural setting. 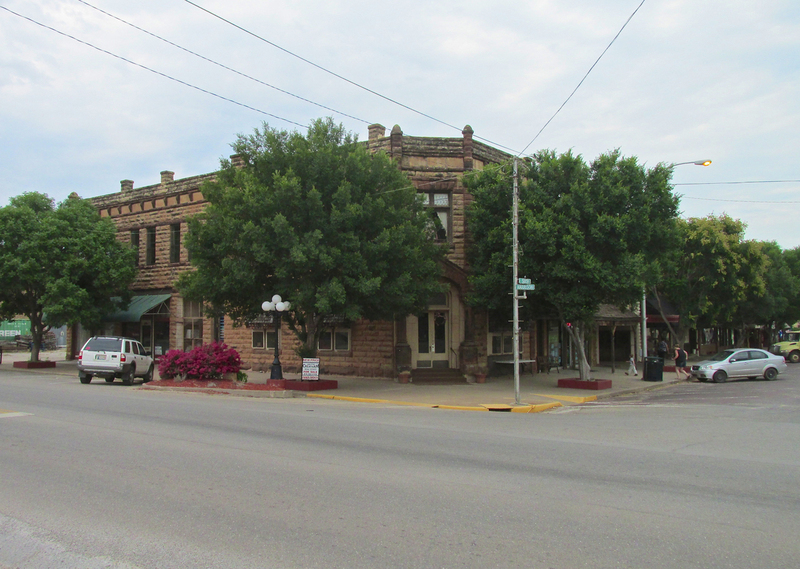 I told him I liked his town and like visiting small towns to take pictures and write about them. Finally he said, “Did you fly in?” and I said, “Yes”. He said he had a feeling I did and that his Son Steven was a pilot for Delta Airlines. The two of them had always loved airplanes and flying. He asked if I wanted a ride back to the airport. Sho ’nuff! Off we went. Les driving his late model Chevy. Arriving back at Pawnee Muni rain could be seen to the Northwest. As we drove to the airport, Les lamented the fact that the old group of flyers that had been active in Pawnee no longer flew or owned planes. He said the Rodeo Arena had taken the place of a goodly section of hangars. During the ride I noticed the inscriptions on his hat laying on the console. I asked for a picture once we arrived at the airport. Les had been on active duty in World War II and Korea with The Airborne and Special Forces. He said it was interesting work. Since Les was familiar with airplanes I wanted him to see mine up close. 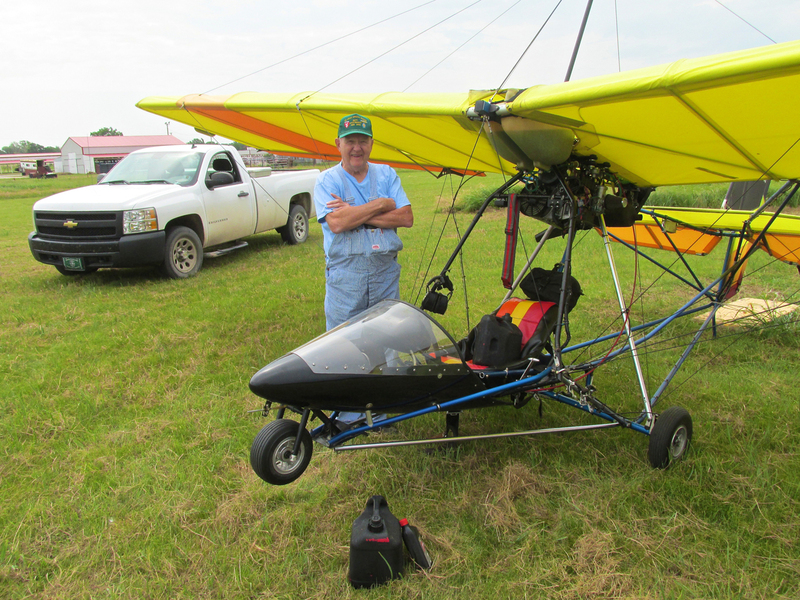 He thought it was pretty interesting and let on that there had been a couple of Ultralights based at the field a few years ago. After looking the Quicksilver over Les announced that he had to pick up his Wife in 5 minutes and needed to go. 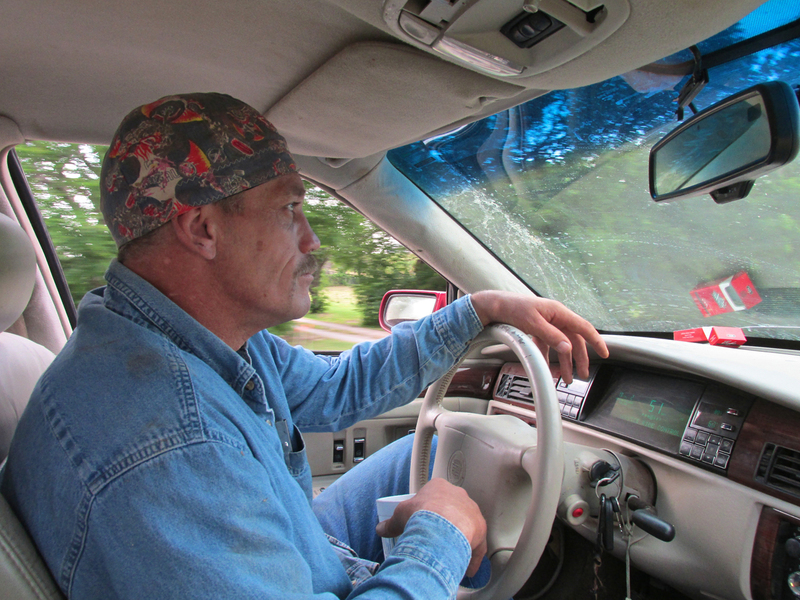 I thanked him for the ride and gave him my card so he could read the story later. Unfortunately, he said he did not use the internet and would not be able to. After a moment is remembered sometimes his Daughter shows him stuff on the Web at her house . He said he would get her to dial in my site next time he visited her. While at the gas station convenience store (before meeting Les), I realized I was a little hungry and grabbed a bag of Goldfish™ for the walk back to the plane. When Les offered the ride, I forgot about The Fish until I was unpacking my bag at the plane. I believe the weather-caster’s term “Scattered Showers” has greater meaning to aviators than regular folks on the ground. On the ground, people have but a vague idea. From that perspective, “Scattered Showers” is perceived in terms of time. It resolves into “the rain comes in intervals” or “expect a series of rainings”. Because the ground observer is for the most part, stationary, Scattered Showers “come upon” him over time. When airborne, though, seeing showers from the side rather than from below, one can see that each shower is an entity unto itself. 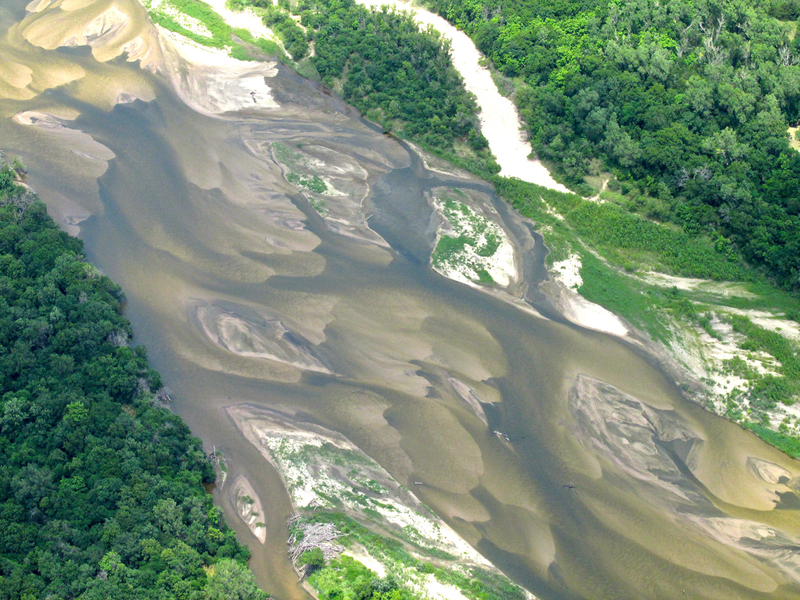 From the air, showers are seen in their true, three-dimensionality. 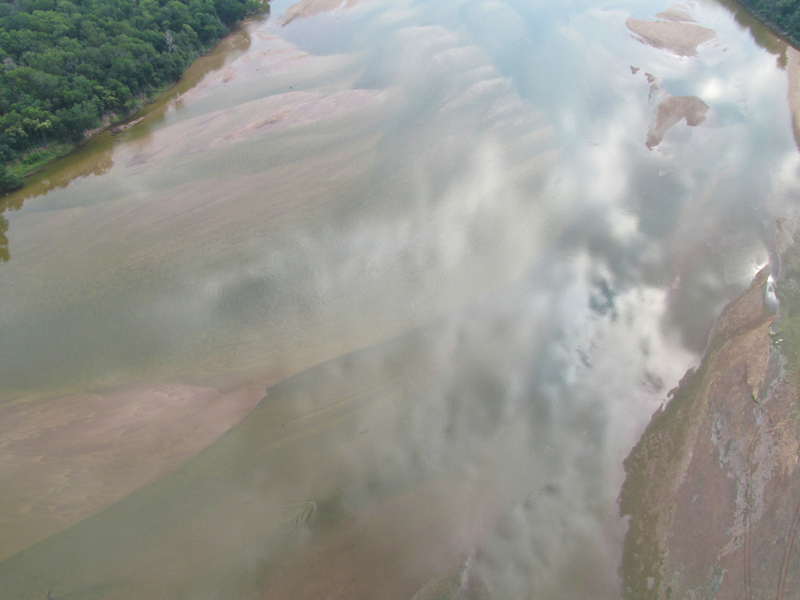 A pilot sees the whole enchilada – The Cloud and The Rain Falling From It. They look sort of like a floating bathroom shower head with water pouring out of it. When a number of these entities can be seen from an airplane – some near – some far – the concept of “Scattered Showers” achieves its full meaning. 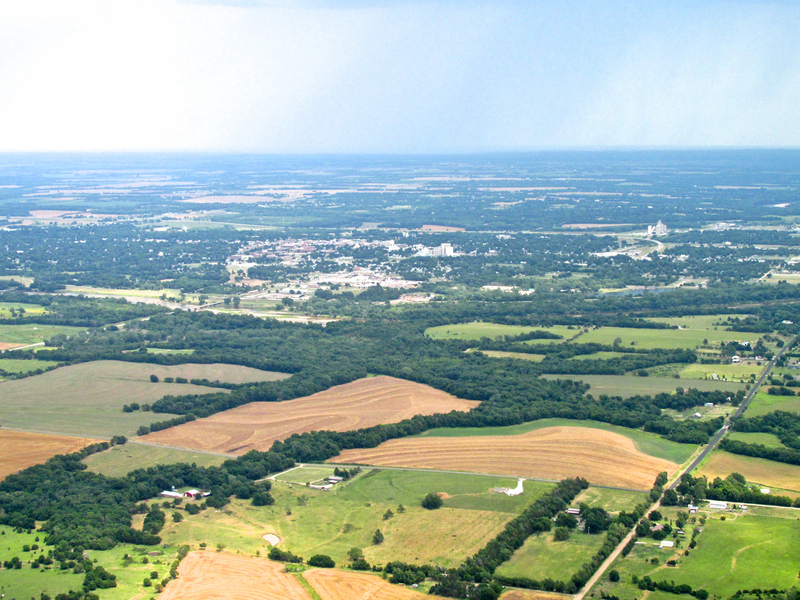 My flight back to Selby Aerodrome from Pawnee, Oklahoma featured Scattered Showers. 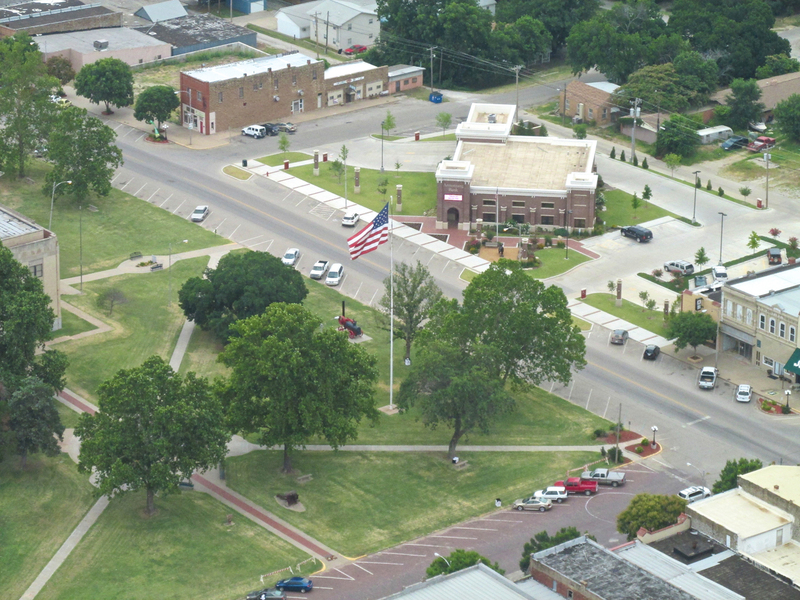 Since I did not take any aerial photos of Pawnee before landing, after takeoff I flew over to the edge of town to shoot the following series. 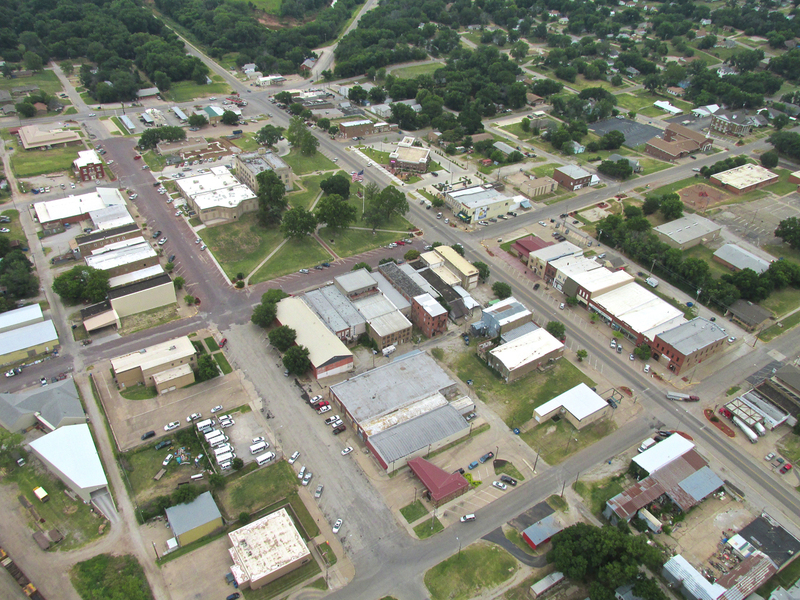 A wide shot of downtown Pawnee, Oklahoma from 1,000′ AGL looking Southeast. 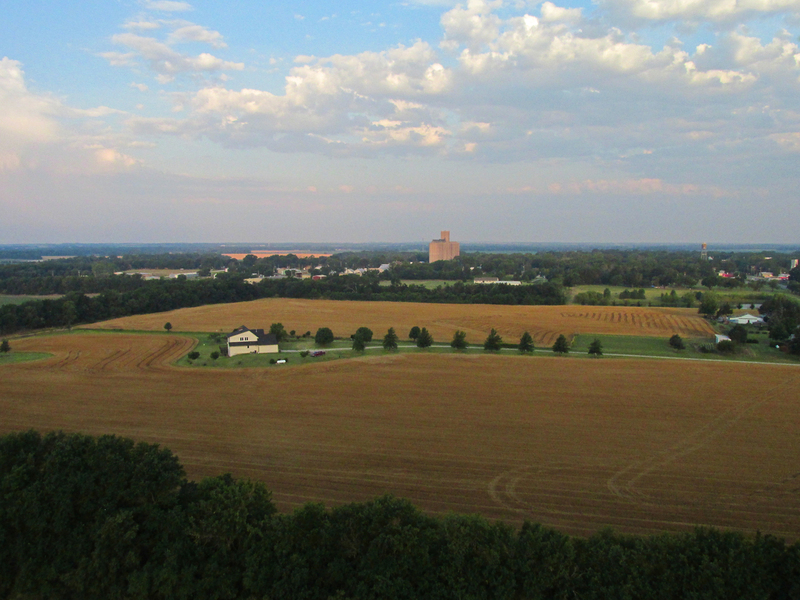 Right after taking the previous shot I turned 180 degrees to a heading due North and took this picture. I am on the edge of town. 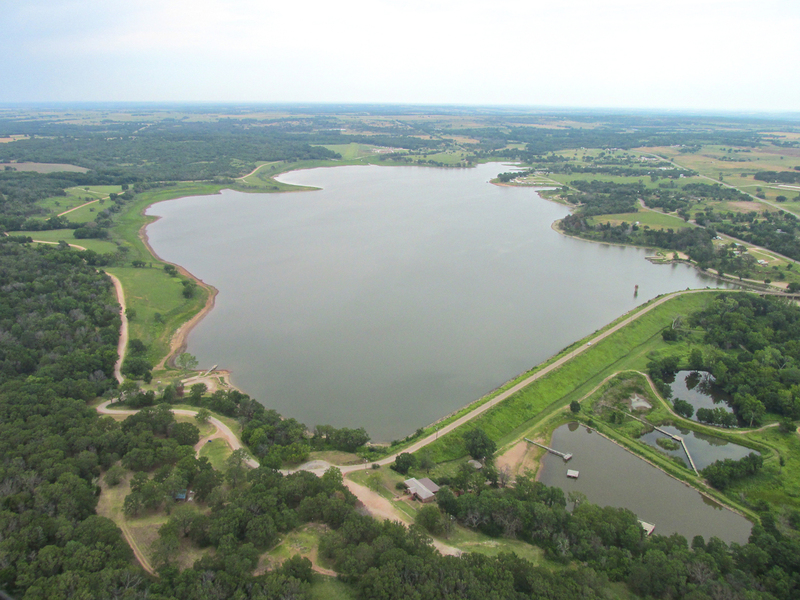 This gives the relationship of Pawnee Lake to the city. 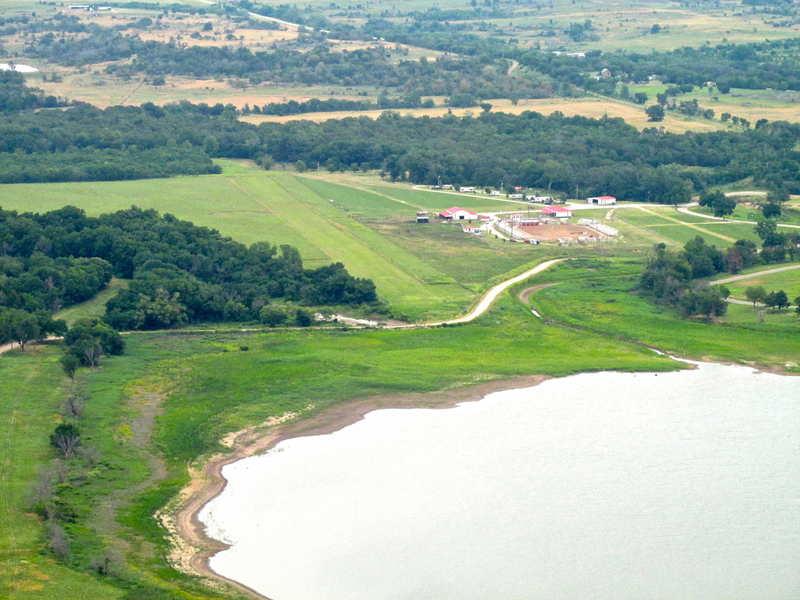 The airport can be seen at the “top” of the lake. After slowly approaching town in a headwind to take the city shots, upon making the 180 degree turn, I was now heading downwind. This had the effect of increasing my ground speed by 20 mph. 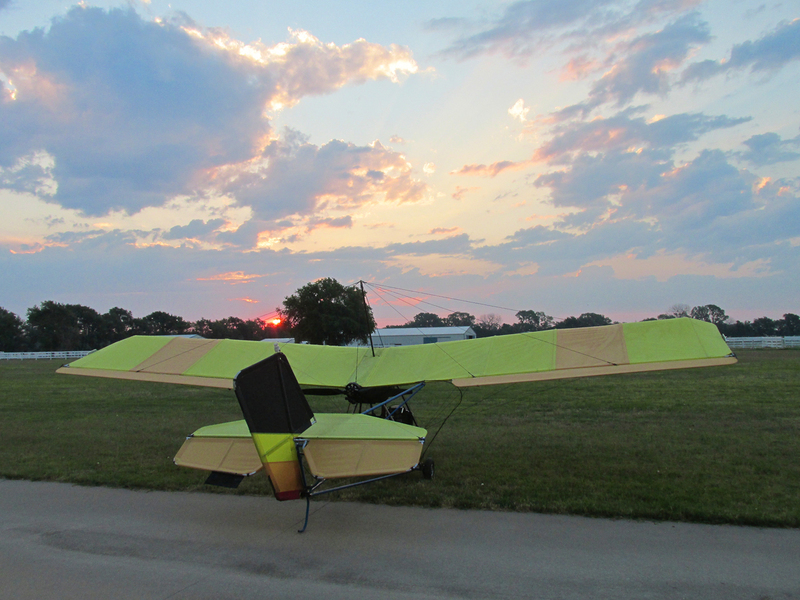 A 10 mph tailwind seems like no big thing until you realize my Quicksilver is only cruising at 40. That’s a 20% increase in speed. Suddenly something Tom Tisher had told me while driving me to the airport triggered my photo instincts. He had told me the Pawnee Nation was having a Pow Wow in town that week. Just before flying over the lake I noticed a stadium to the East. In the football field was a grouping of benches that one normally does not see on a field of that type. I decided that must be where The Indians were holding their meetings. I had to use the telephoto to get the picture shown below. No one was on the field at the time. 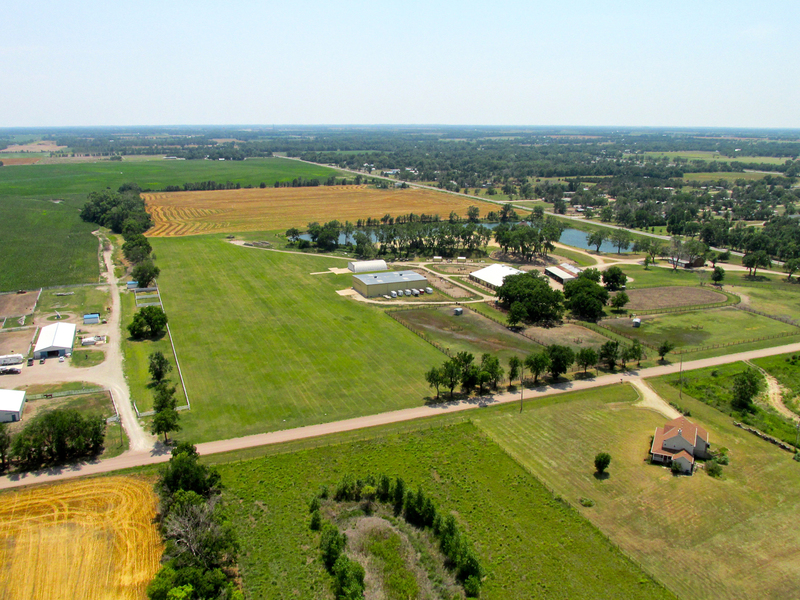 Pawnee Municipal Airport and The Memorial Rodeo Arena from 1100′ AGL looking North. 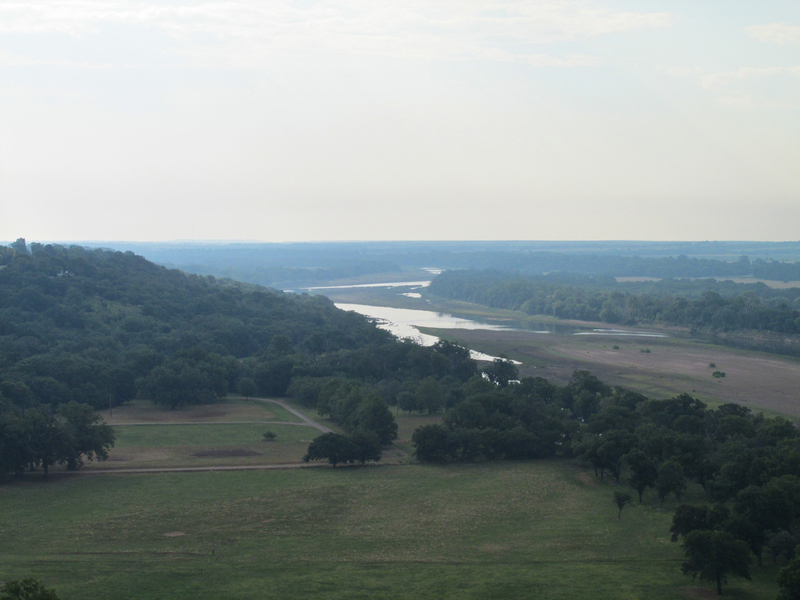 9 miles North Northwest of Pawnee I crossed the Arkansas River again. 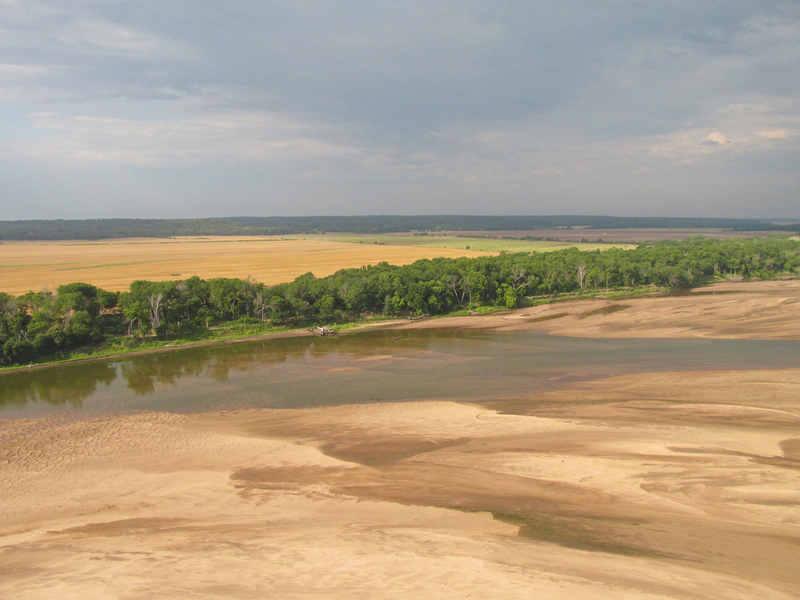 This time the lighting was better for revealing the beauty of the alluvial plain below. I am at 800′ AGL heading Northwest. The finely spaced rows in this field made it an interesting subject even though the overcast sky gave only “soft” light. Notwithstanding my long dissertation above regarding “Scattered Showers”, many times rain is not visible before you fly into it. On those occasions in my open air Ultralight, light rain manifests itself as “a feeling”. Light rain hitting your face and arms on a warm day provides a sensation not of wetness but more akin to scores of Micro BB’s shot randomly at your person. The wind and heat evaporate these watery projectiles immediately. Small drops are tolerable. Large ones can really sting. Because I saw evidence of “Scattered Showers” around the region after takeoff, I was not surprised when I encountered these sprinkles. At the same time, looking ahead, I could see a substantial column of rain moving from the Southwest that I would be intersecting if I continued my current course. So, even though the sprinkling I was receiving at the moment was tolerable, I decided to land and wait for the shower ahead to pass by before continuing. 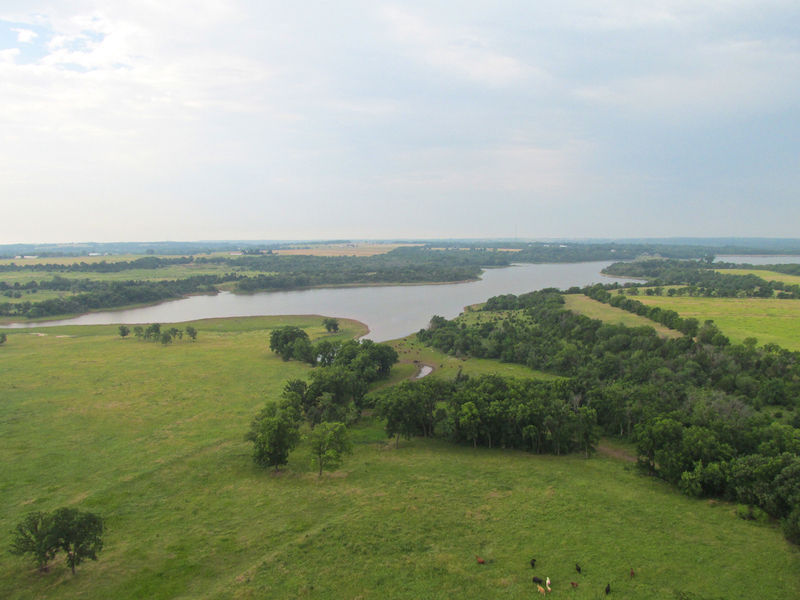 It has been over a century and a half since there has been “free land” out on The Plains. 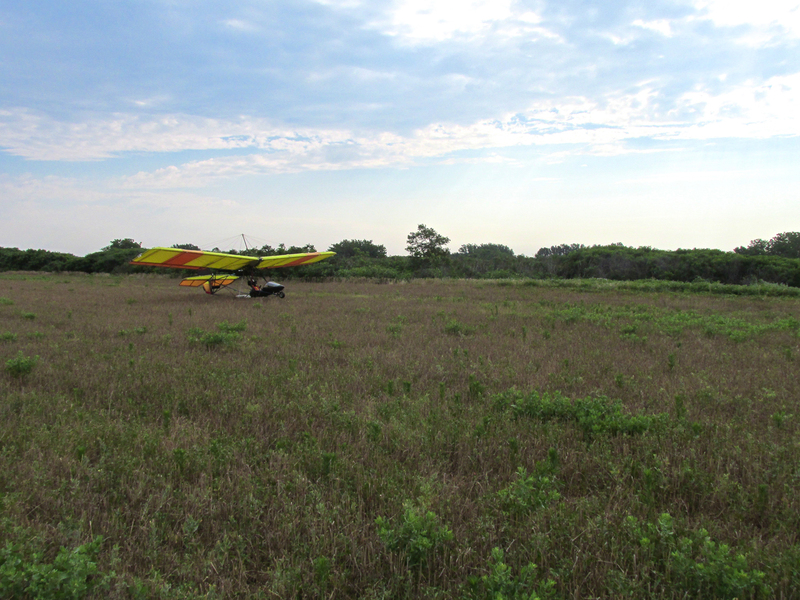 Whenever I land anywhere that is not a prescribed airstrip I am landing on someone’s property. Frankly, nobody cares as long as you don’t scare the livestock or damage crops. 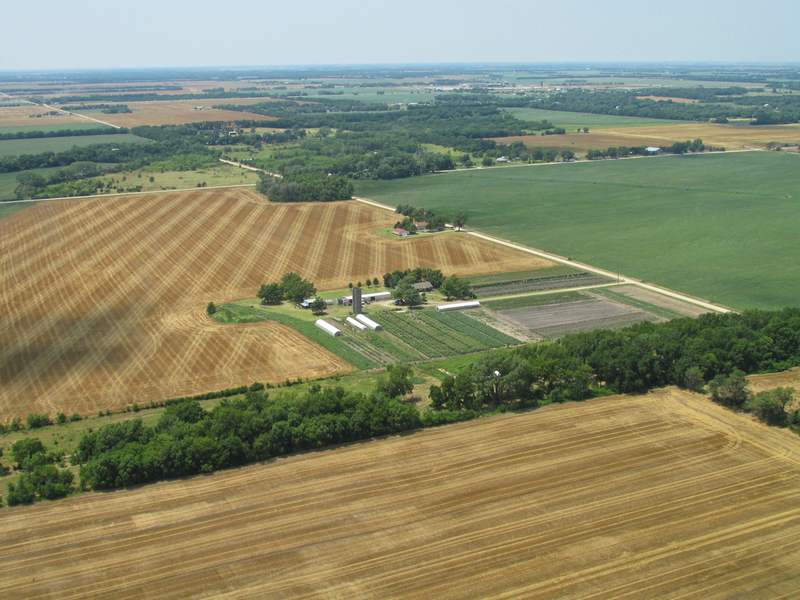 From a pilot’s perspective it would not be wise to land on crop fields anyway because they could also damage the airplane AND potentially make it impossible to take off again. 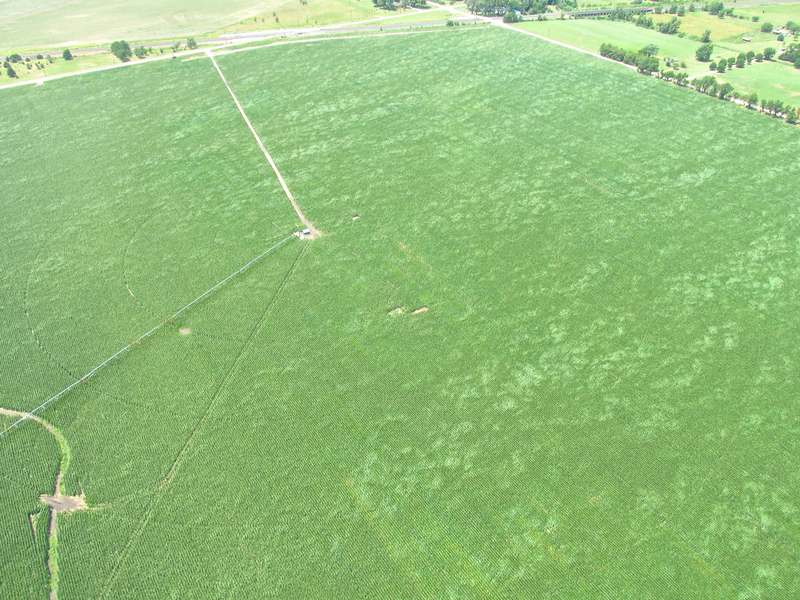 Even when a crop is “low” and just starting to grow, the fields they are planted in are less than optimal for my plane. The furrows can easily be deeper than the height of my tires and therefore present the real possibility of flipping over after touchdown. That being said, I surveyed the landscape below me for a suitable field. Within a minute I saw what looked like the perfect fallow wheat field next to the river. It also matched another element of my criteria. It contained a stand of tall trees on its South edge to block wind and rain. I made a low pass to check it better and then circled and landed. The landing was uneventful. I pushed the Quicksilver under the perfect tree umbrella seen below. 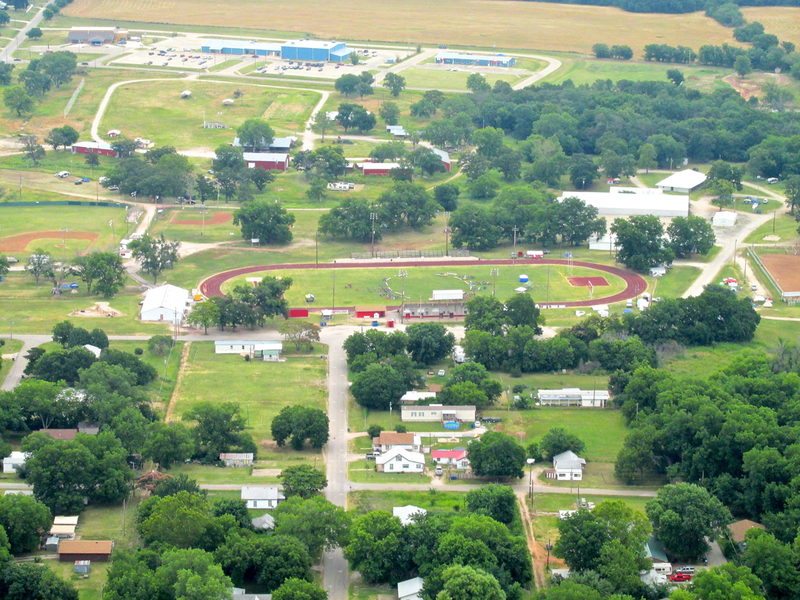 This telephoto shot portrays the field as I saw it from above. Fallow Wheat. 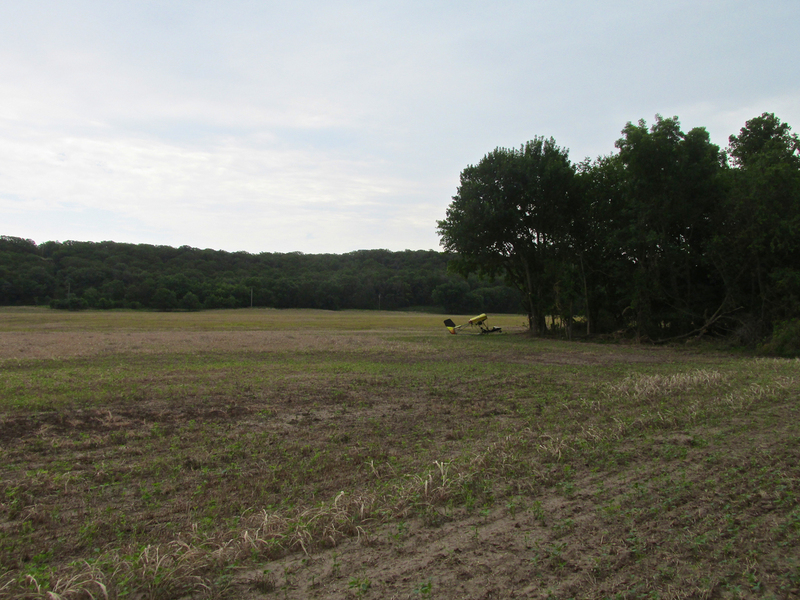 Even though I had done my best to survey the field before landing, I am embarrassed to reveal that it was a planted field. From the sky it appeared as you see in the photo above. 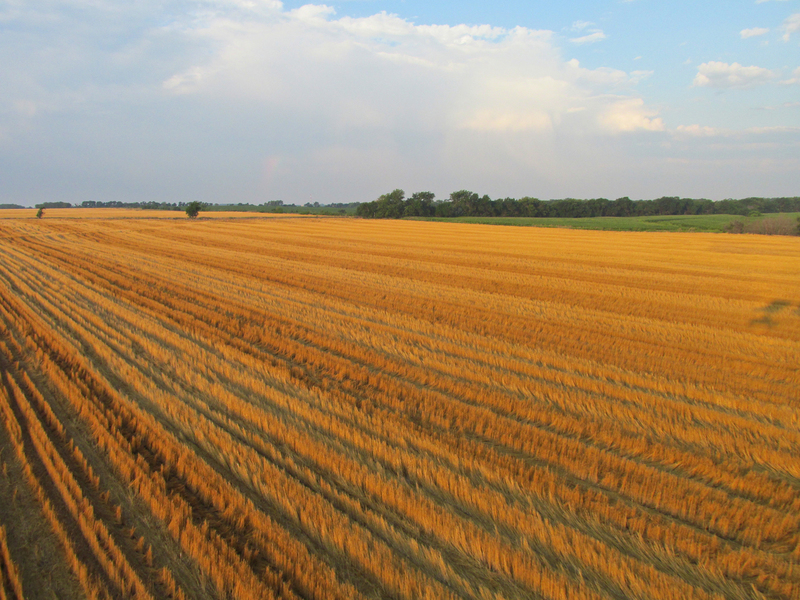 But, once on the ground, I realized there were crops planted “inside” this random wheat. I think they call this method “no till” or “double cropping”. Out on the edges of the field, under the tree line the crop is more apparent. 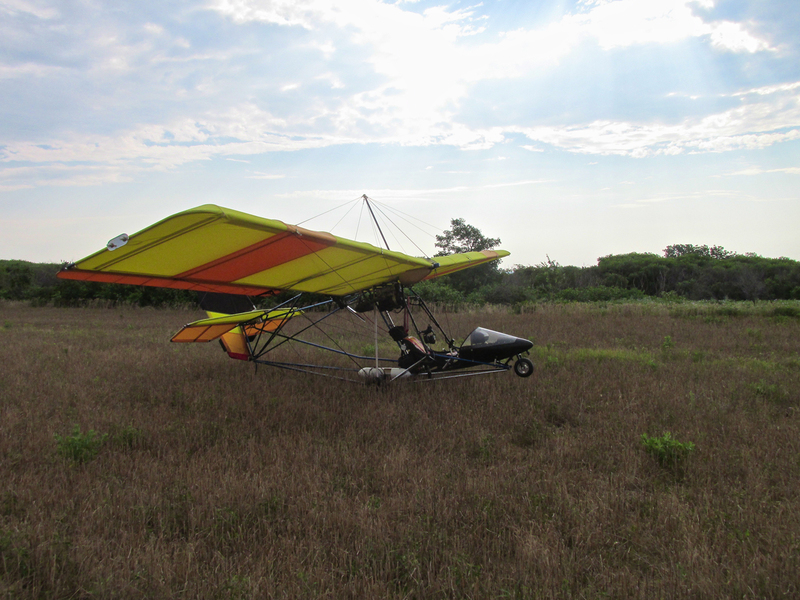 Fortunately, my plane is so “Ultralight” with its weight distributed over its soft tires, the plants rebounded after my tires rolled over them. 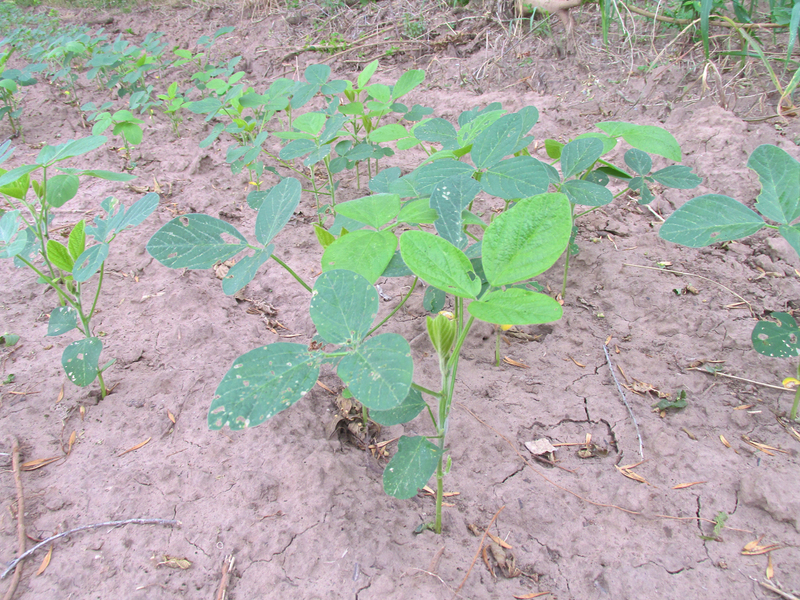 I think they were soy beans and I could see no damage behind my tracks. I took this picture near the edge of the field as I walked over to the river. 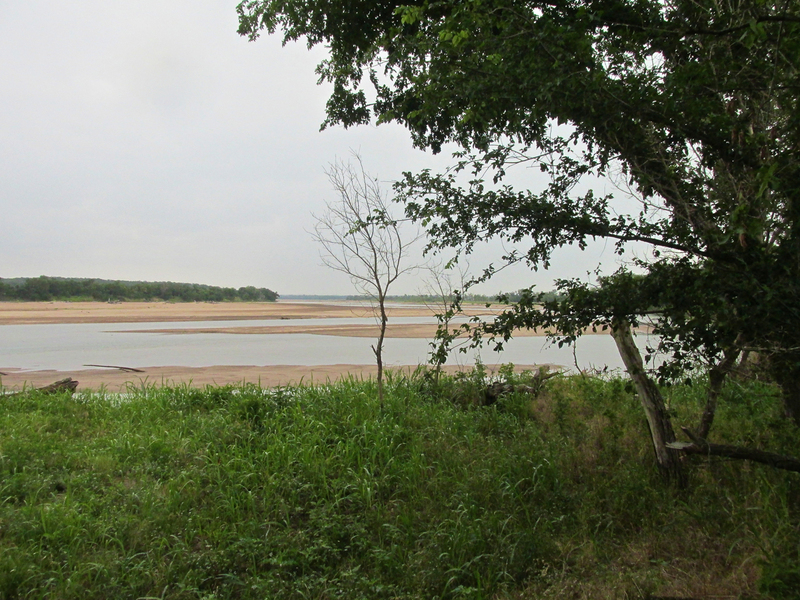 While waiting for the light sprinkle to stop I walked around the edge of the field to see the river through an opening in the trees. I spent a peaceful hour in the field. It was quite nice. After walking back from the river the rain suddenly let up – time to go. 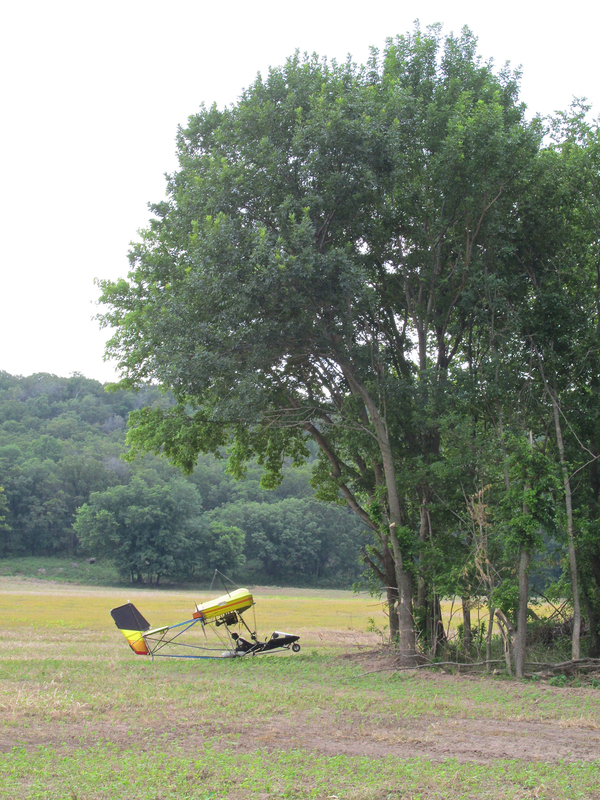 It took about five minutes to push my MXL to the South end of the field. Even though the general wind was from the South, down in the meadow there was no apparent wind at all. 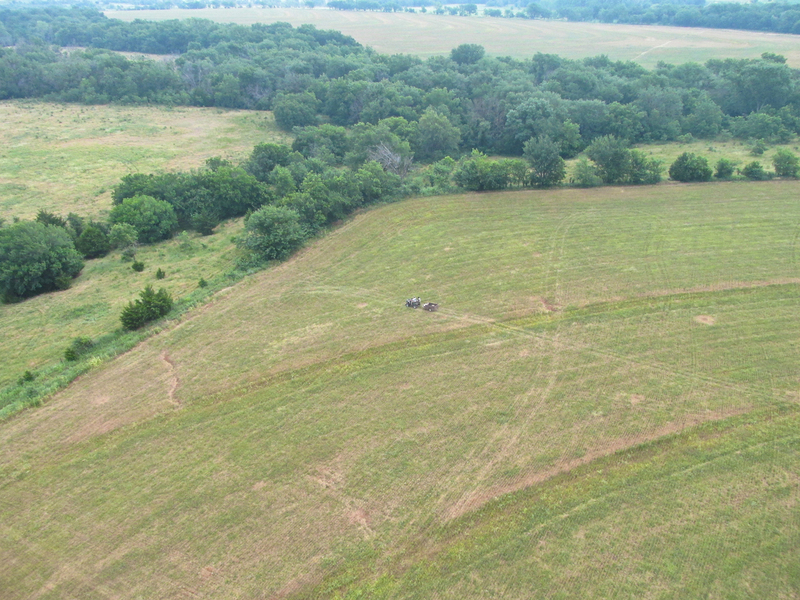 My plane was closer to that end and there was a flat dirt area there, too. So, I would take off to the North. Literally, I had just started the motor and was putting my goggles on and it commenced raining again. This time harder than before. 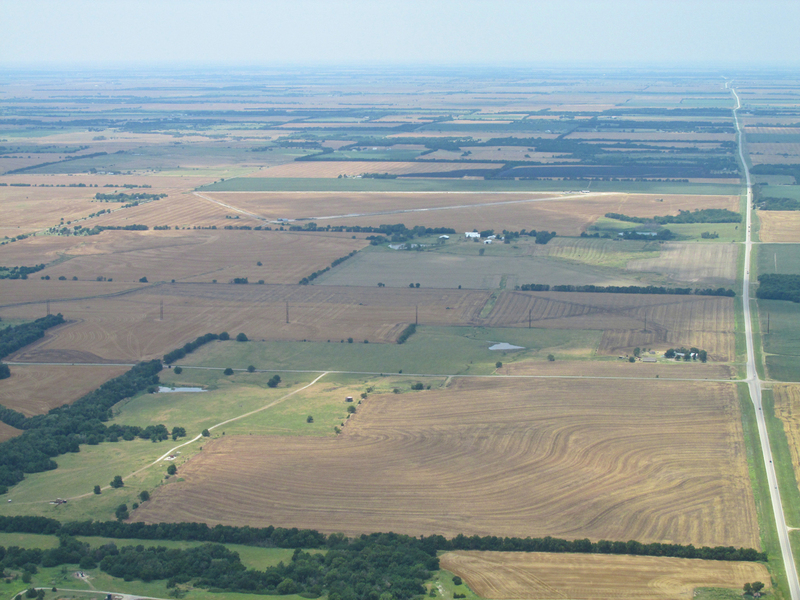 I remembered seeing a shower far off to the South when circling to land in “the bean field”. I reasoned that it was upon me now. 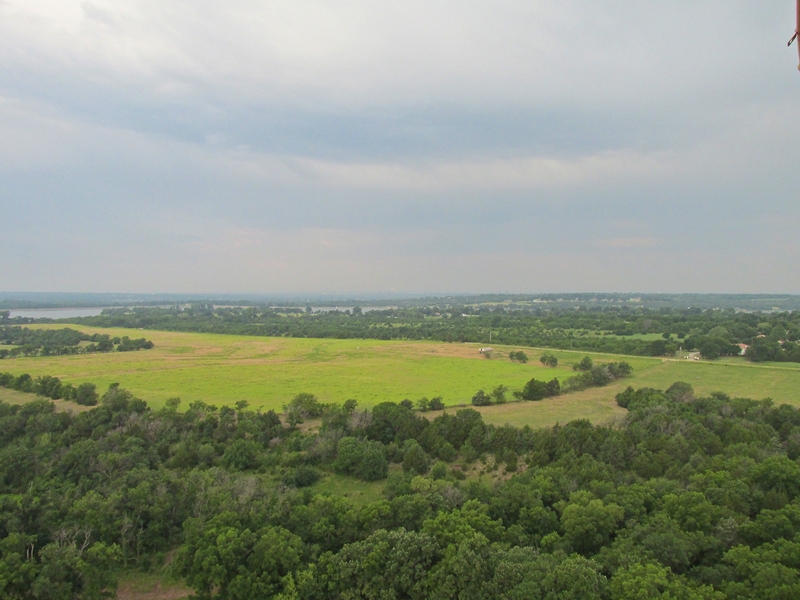 I also realized I had no idea how wide it was and if I stayed on the ground that “Scattered Shower” could rain on me for hours. I fired up and took off expecting to break out of the shower shortly. 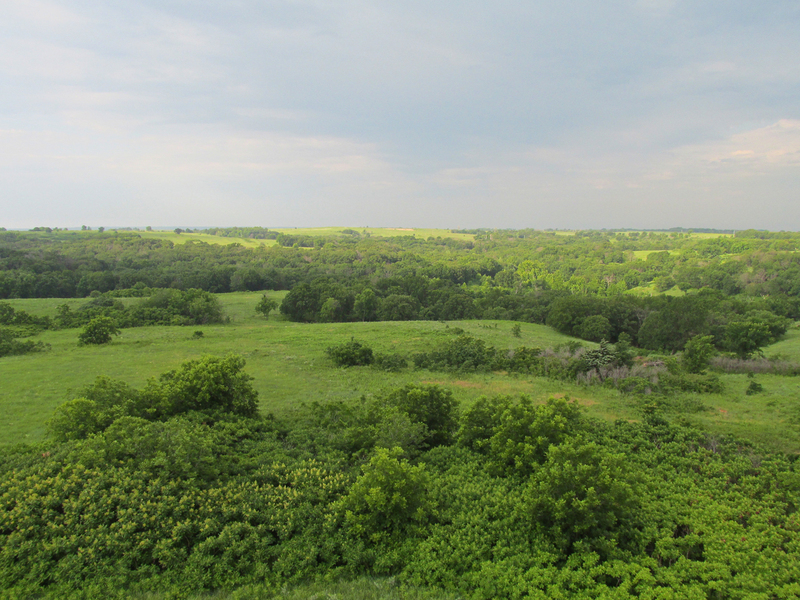 I wanted to take a better photo of “the bean field airport” but it was quite turbulent upon rising above the trees. Also the auto-focus of my camera latched on to the silver tube in the foreground. This photo will have to do. Note the rain on the tube. 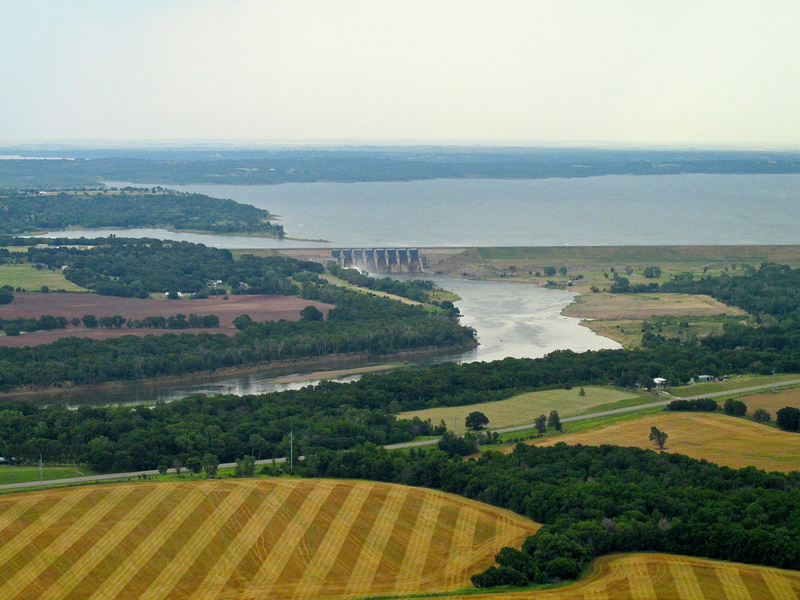 This time, approaching Kaw Lake from the South, you can see the dam that was constructed in 1976 to bring it into being. I was out of the rain now. Still mostly hidden in the mist, Ponca City is slightly more visible this time. 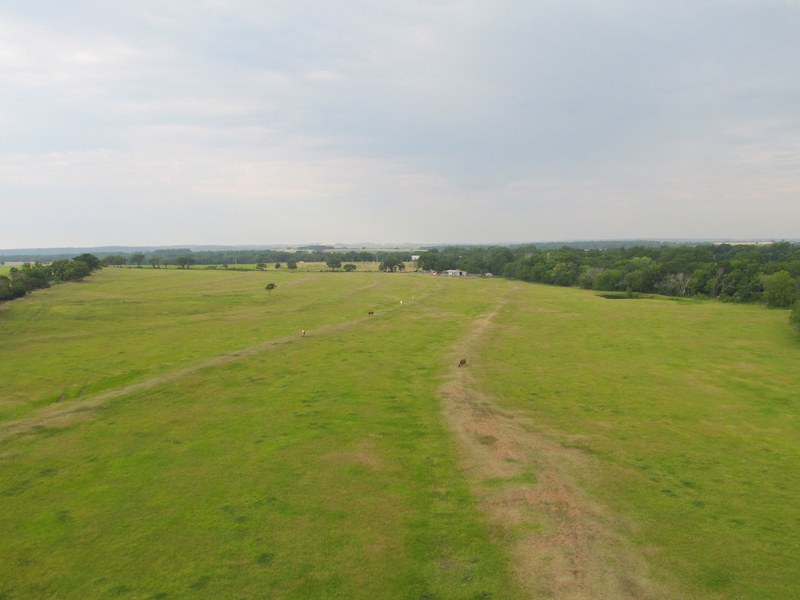 From 1,000′ AGL looking West. A cell of rain is falling in the distance. A break in the clouds brightens the land below. 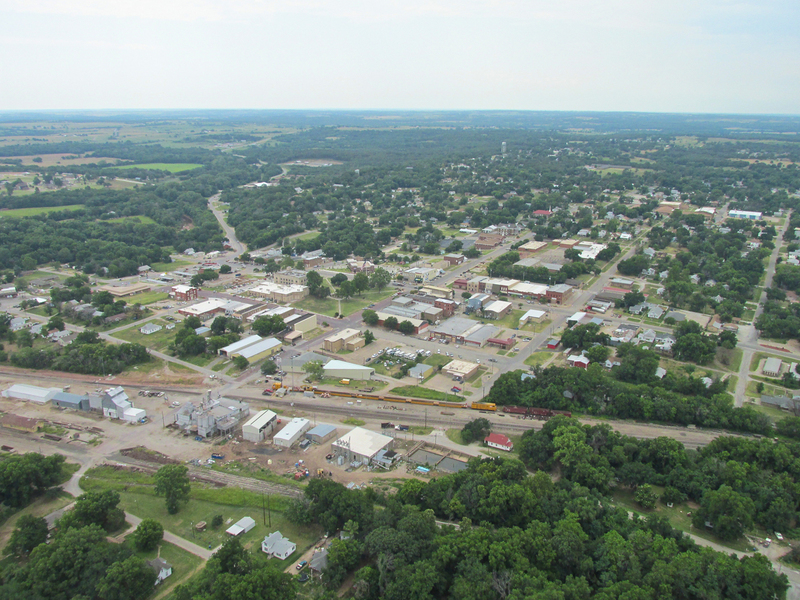 Arkansas City and Winfield can be seen in the distance. 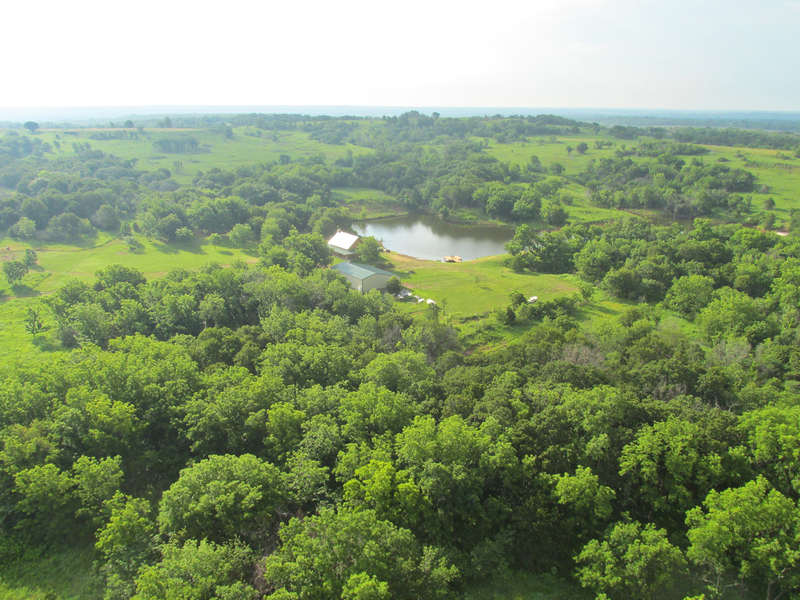 Looking North from 1,000′ AGL. 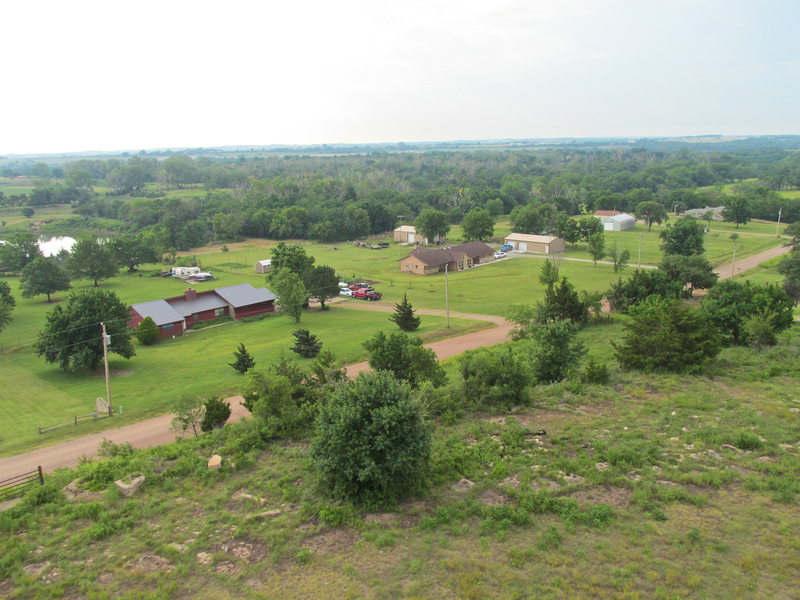 From the previous set of photos you might notice I am flying at a much higher altitude than on the way to Ponca early that morning. For The Sky Surfer, it is like being in The Stratosphere. As detailed in The Sky Surfer Safari Flight Guide, this was done to better “catch the wave” of the South Tailwind that day. At this time it was a smooth, steady, leisurely 10 mph push. 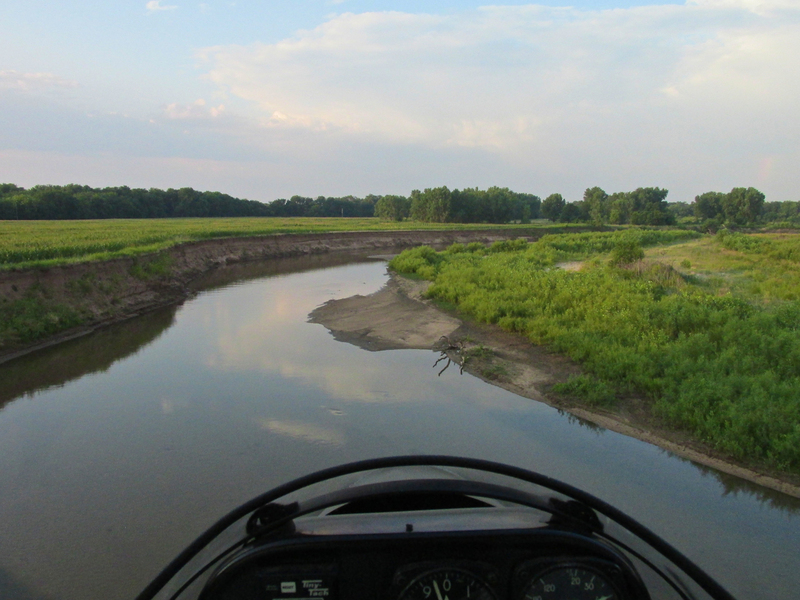 Nothing like the return trip from Perry, Oklahoma earlier this season (a 35 mph tailwind! See HERE). Just a nice wave to ride home. 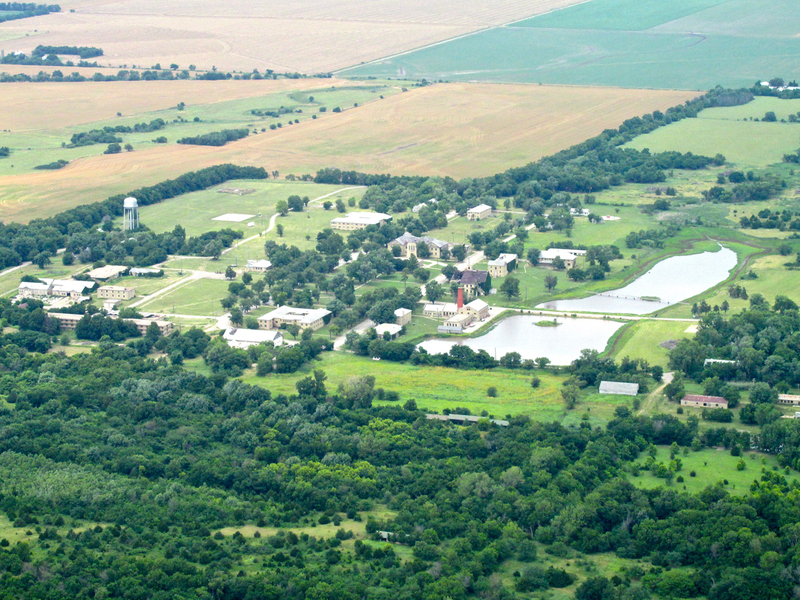 Newkirk, Oklahoma – The Kaw Southwind Casino in the foreground. Even though I have made flights through this general area a number of times, I am still struck by the social/historical contrast portrayed in this series of pictures. Above we see a Casino owned by an Indian Tribe. 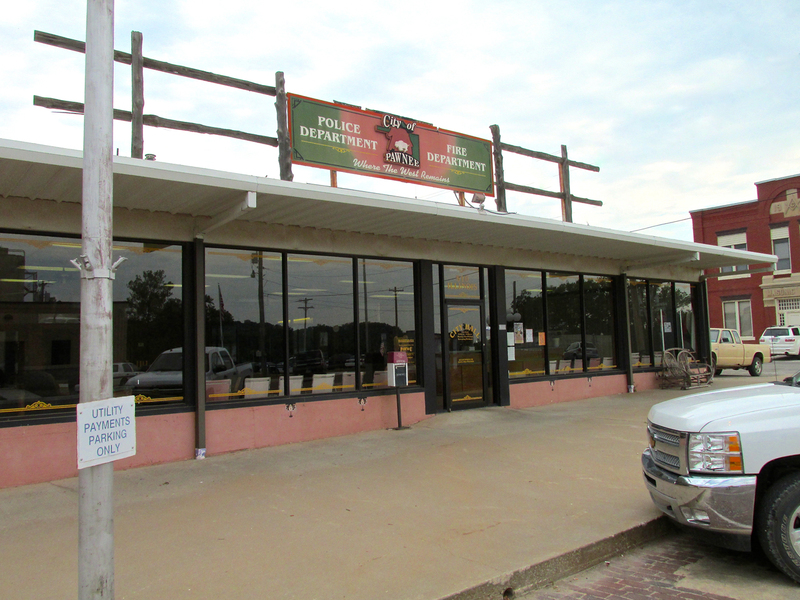 It is one of a great many Indian Casinos in Oklahoma now. 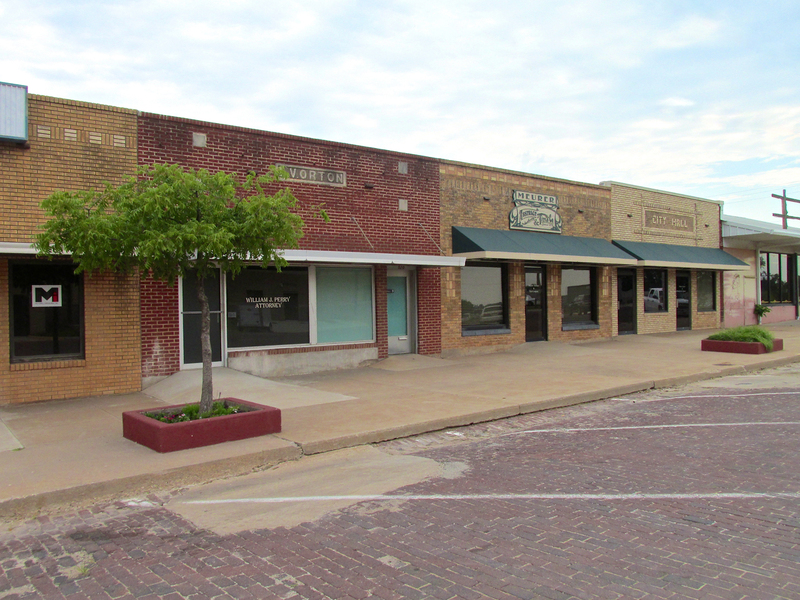 A short space farther on my path, a mere 5 miles South Southwest of Arkansas City, Kansas are the remains of The Chilocco Indian Agricultural School (pictures below). The School and the Casino are less than 8 miles apart geographically but might as well be on different planets socially. America has changed dramatically since I was a youth. Change is to be expected but is this Progress? 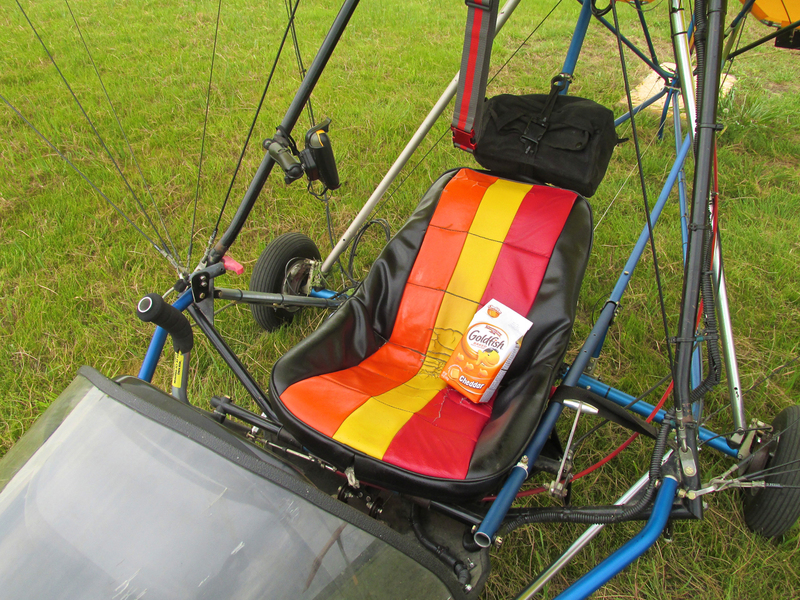 Even though my Quicksilver is not a glider, in the right conditions, thermals will lift it upward like a helium balloon. 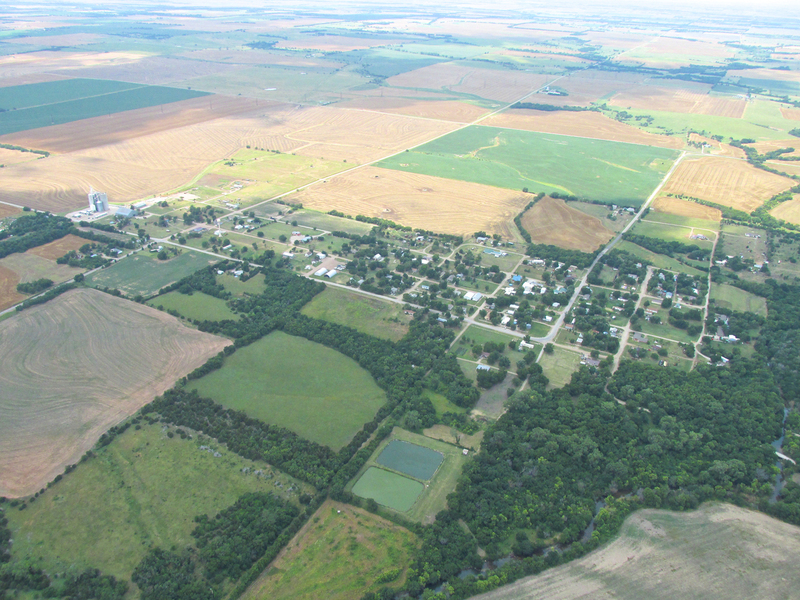 As I passed between Newkirk and Ark City, the thermals caused me to gain a thousand feet of “free air”. “Free Air” is a Sky Surfer term for “unearned altitude” gained without the expenditure of fuel. Thermal forces were powerful that afternoon. 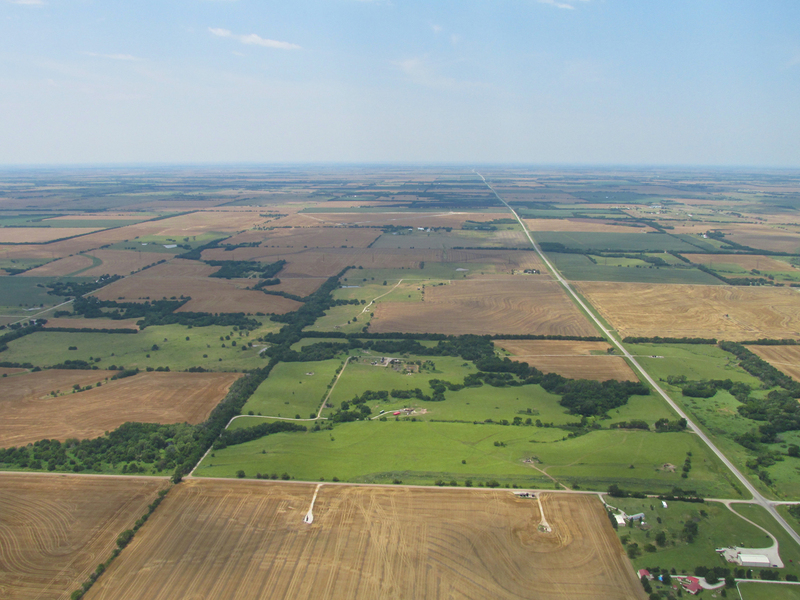 Arkansas City, Kansas from 2,000′ AGL looking East. Note the rain in the distance. Just after taking the picture above, I felt a definite, sudden push from behind and the left. The tailwind was accelerating. Over about a minute it sped up from 10 mph to a high of 35 miles per hour! 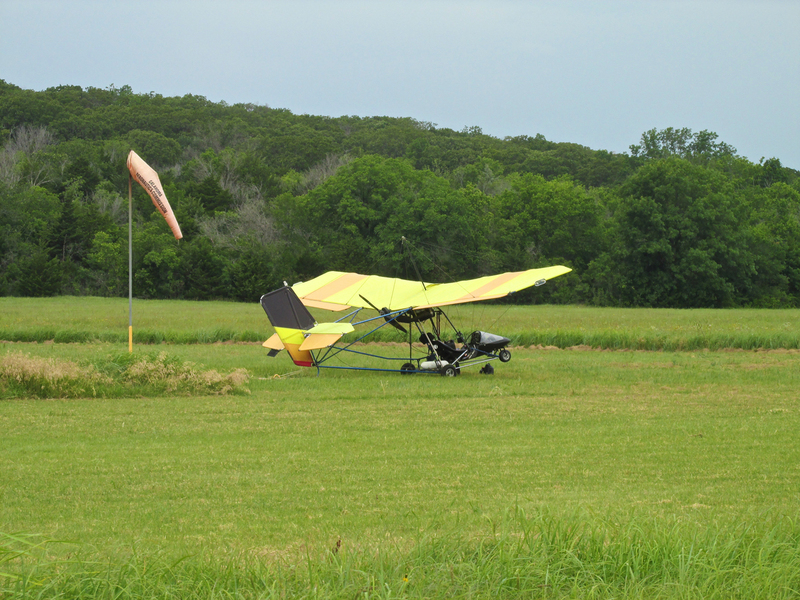 When I earned my Pilot License, figuring winds aloft was complicated. First you had to figure Ground Speed. 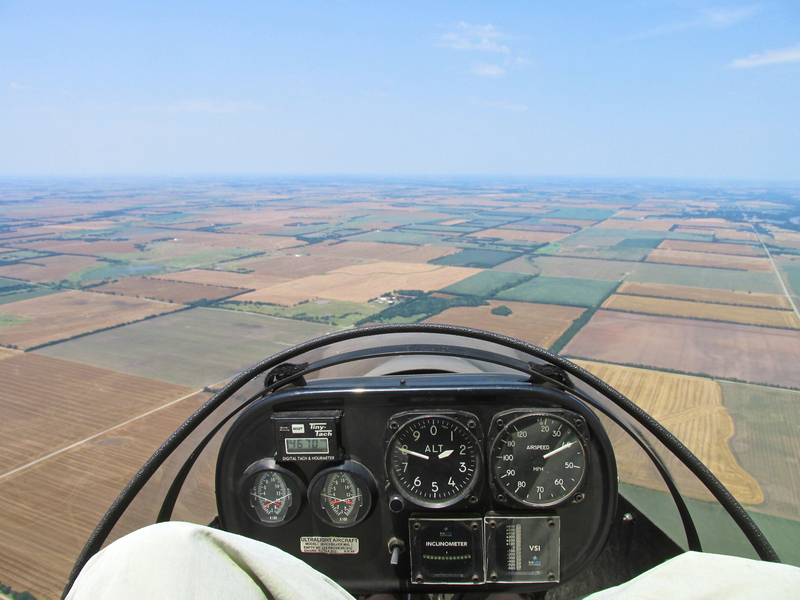 Determining ground speed while airborne was a matter of passing over landmarks featured on your sectional map, timing your flight between them, and then calculating the speed it took to travel that distance. That gave you your ground speed. Then after calculating your True Air Speed (I won’t get into that), you figured the differential between the two speeds to get your wind aloft speed. One of the benefits of GPS technology is that it calculates your Ground Speed constantly. Using that you can quickly and easily determine your winds aloft by taking the difference between your air speed (shown on your airspeed indicator) and your ground speed (shown on your GPS). The differential of these two figures is the wind aloft speed. That’s how I can tell you I had a 35 mph tailwind. 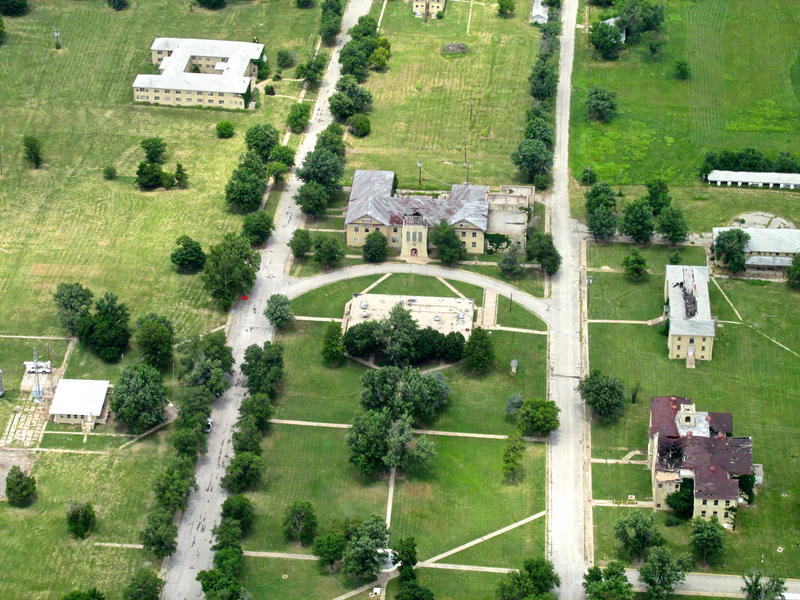 On the flight home I had planned to fly over both The Indian School and the WWII Training Field, Strother #2. Now that I was the recipient of an increased tailwind, I decided to forego the detour over Strother #2. Instead I reached out to it with my telephoto. 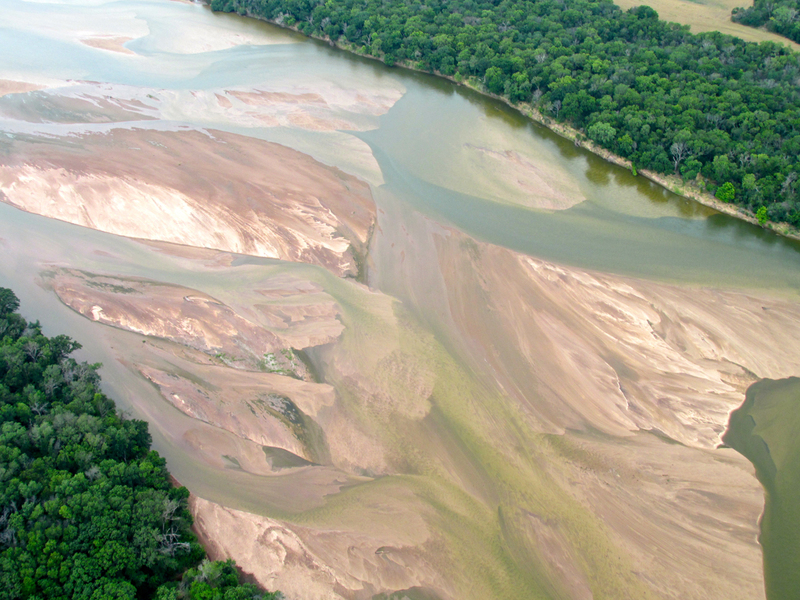 If you want to see some good “straight down” shots of it from another flight, go HERE. 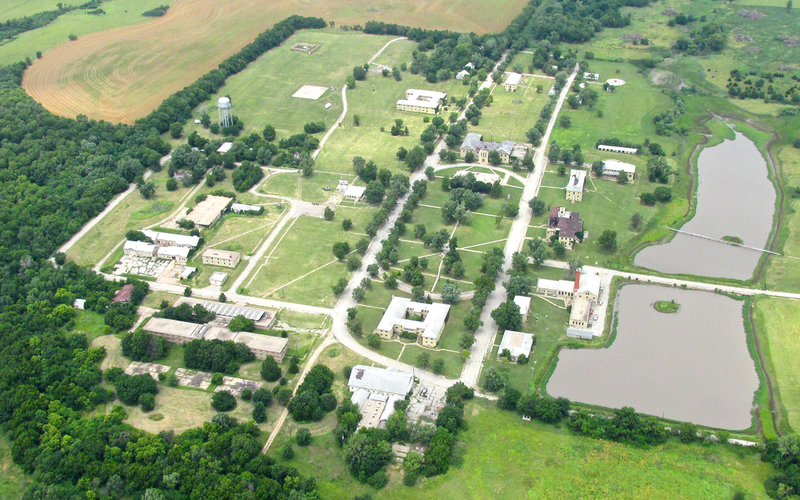 Strother Air Field #2 is the “triangle” in the distance. That is as close as my telephoto would bring it. 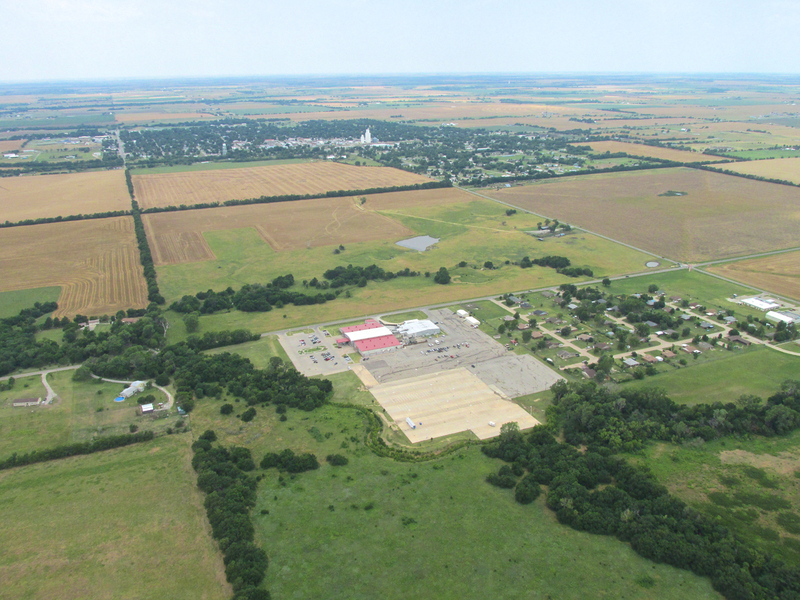 Taken from 2,000′ AGL looking West. 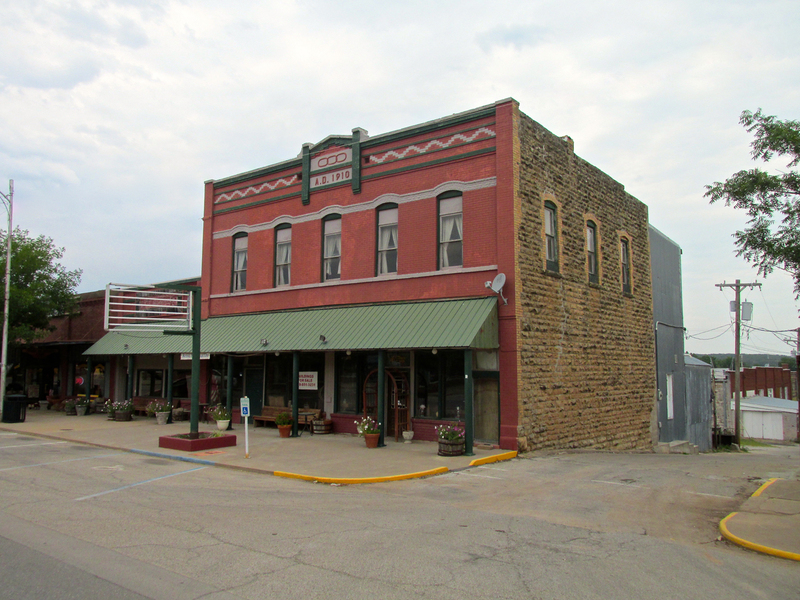 Geuda Springs, Kansas. I like the look of this place. It is on my list to visit. 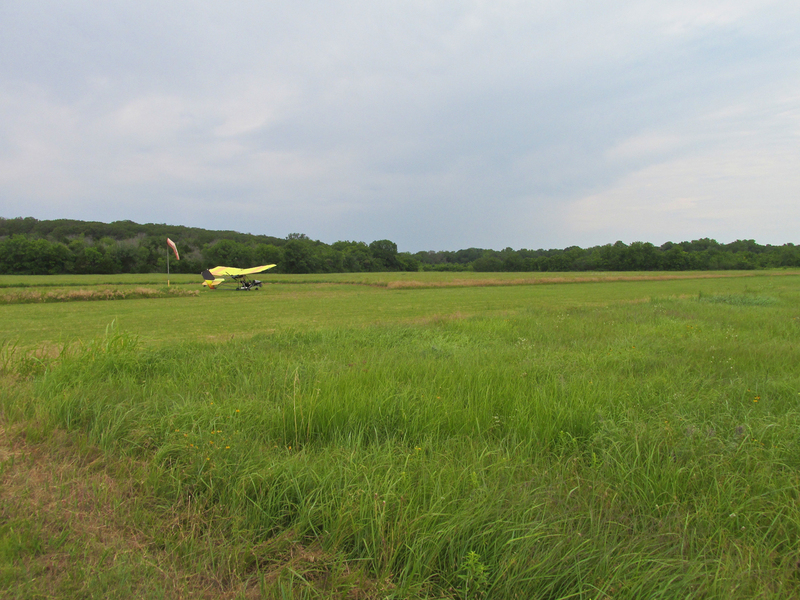 Because it has no airfield I will have to get someone’s permission to land in a field nearby. With more of the sun breaking through the clouds, I had to capture more of the “alluvial beauty” I enjoy so much from up here. 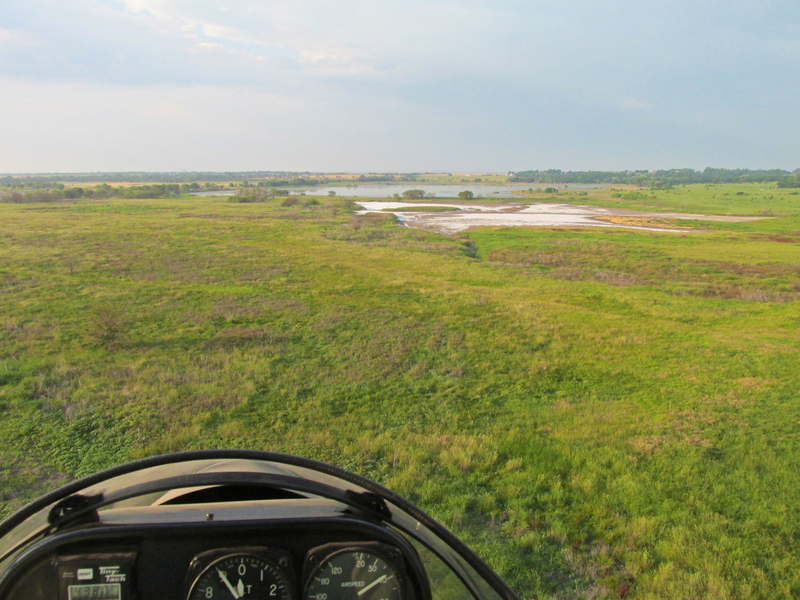 From my 2K altitude advantage, to the West, I could see the salt flat/marsh area I had skimmed over early that morning. 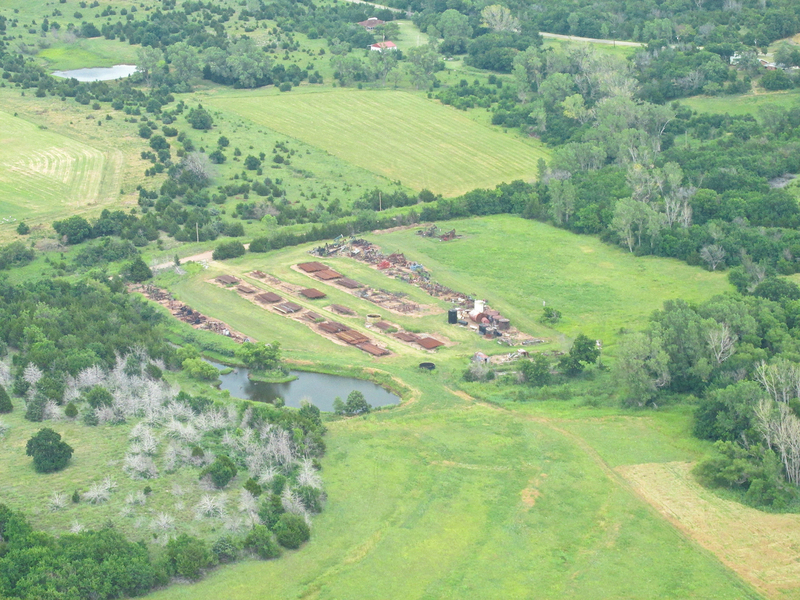 Just past Oxford I saw this big drilling project. 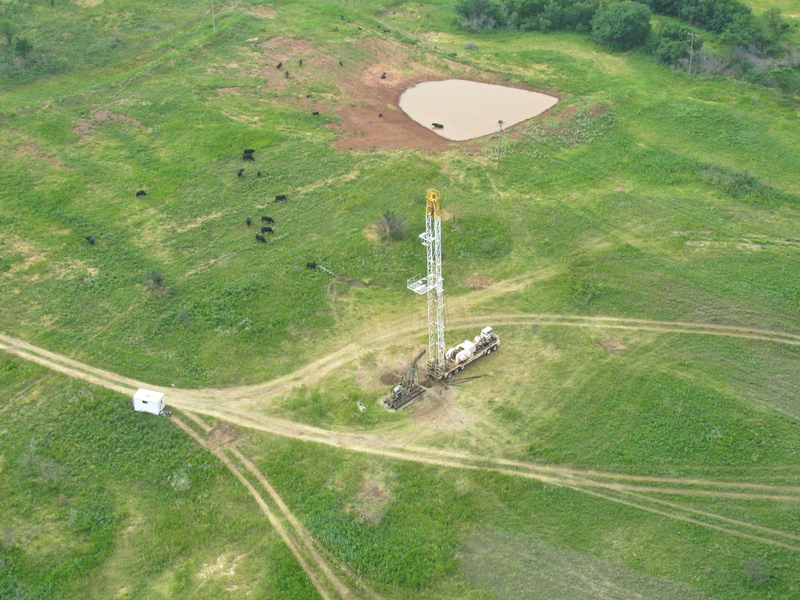 I am pretty sure this is a horizontal drilling rig. 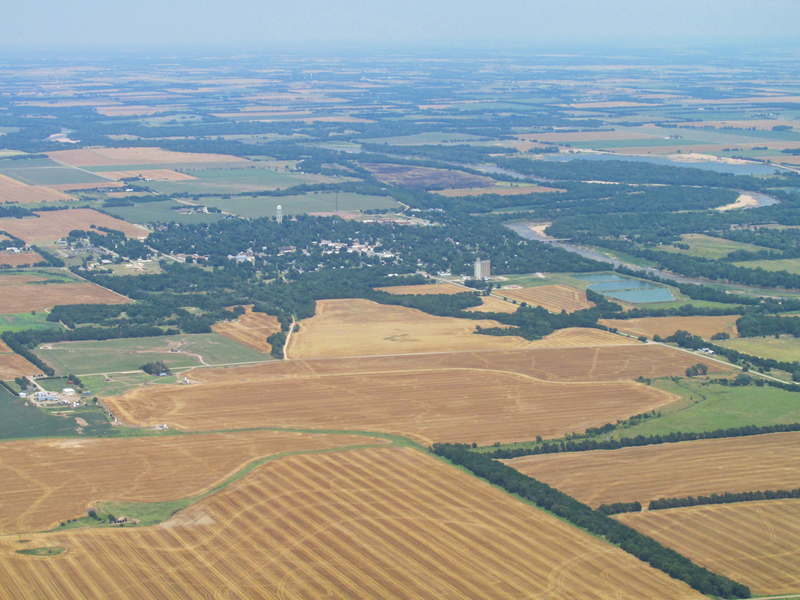 From the Oxford area I cut power even more for a descent to 1,000′ AGL. While still benefiting from the tailwind, as I approached The Air Capitol I preferred to fly lower. Even though I have excellent visibility forward and to the sides, there is the infinitesimally small chance that someone in a faster moving airplane would not see me and run me over from behind. Most of those guys fly 1,500′ AGL and higher so in this relatively higher traffic area staying below 1,000′ is more prudent. 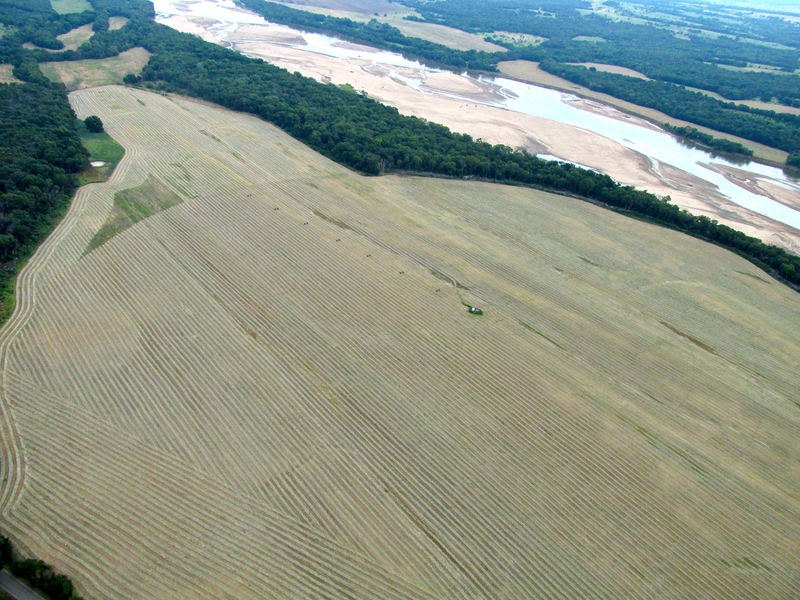 The “rivulets” in this wheat field indicate the 35 mile per hour tail wind. 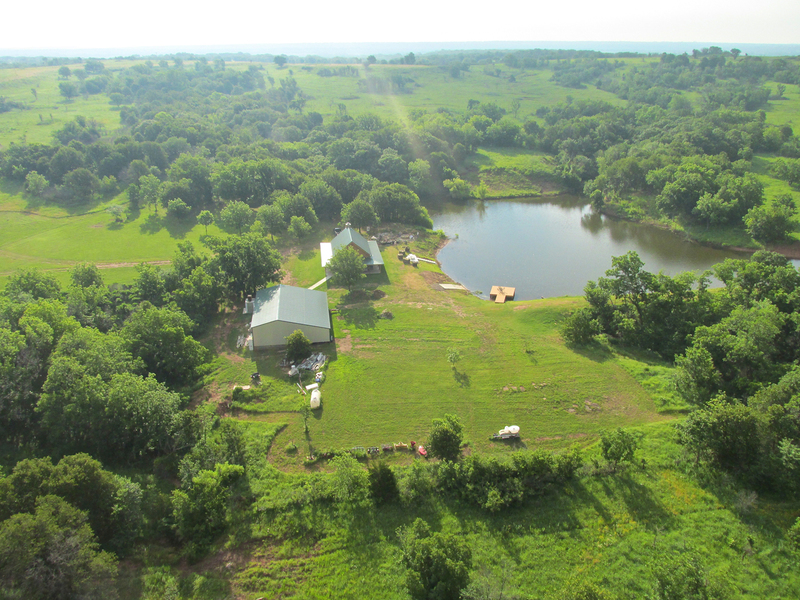 The only thing special about this photo was the general beauty of the landscape and the farm in the foreground. 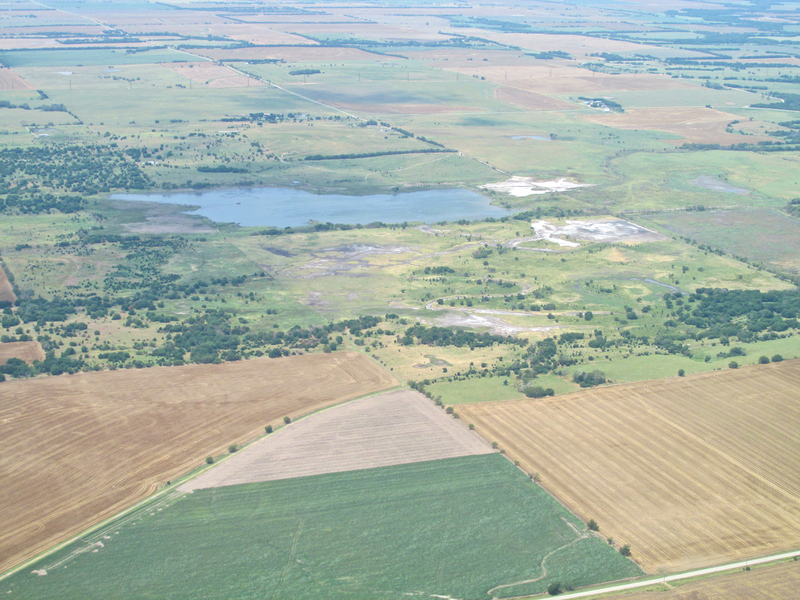 Whizzing downwind at a ground speed over 70 mph, I managed to snag this shot of Lake Selby while bucking in air turbulence. 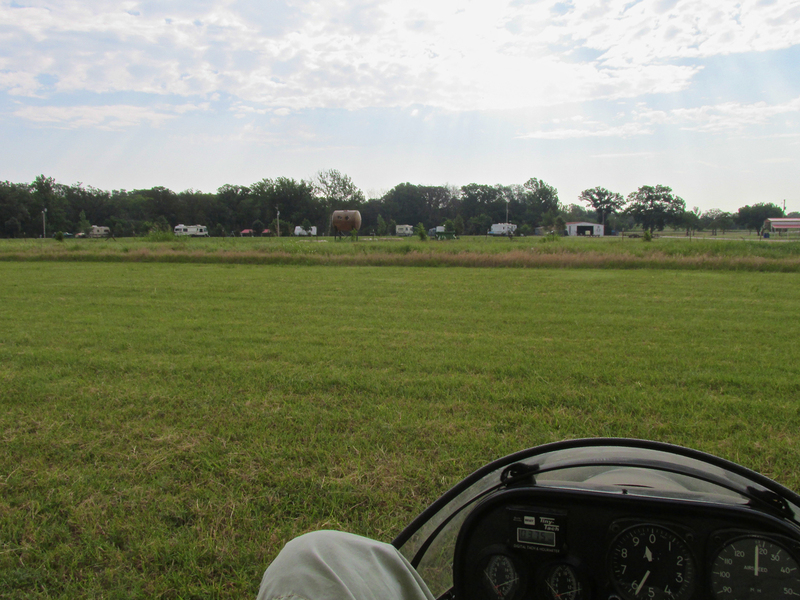 After making the “high speed pass” shown above, I pulled a high bank, 180 degree turn back into the wind. Now facing into the 35 mph wind, I pretty much hovered on final approach. With time to kill I contemplated my landing and – of course – documented the event by taking the picture you see below. 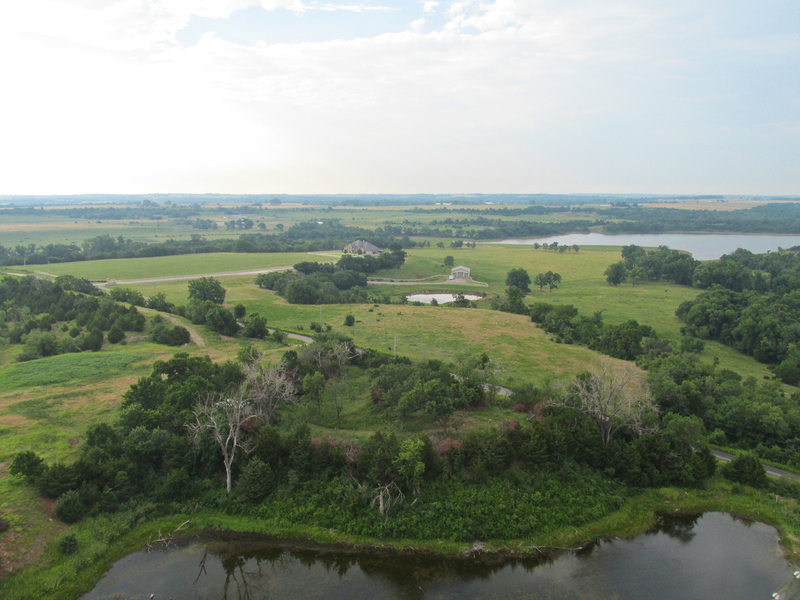 The “big plan” would be to land in front of my hangar and then taxi into the wind shadow of the “round hangar” occupied by Brother Steve Ewing’s Quicksilver Ultralights. If this is your first Sky Surfing story, suffice to say, this wind shadow stuff is very important. My Ultralight can literally flip over on the ground in high winds. Care must be taken upon exiting the pilot seat. 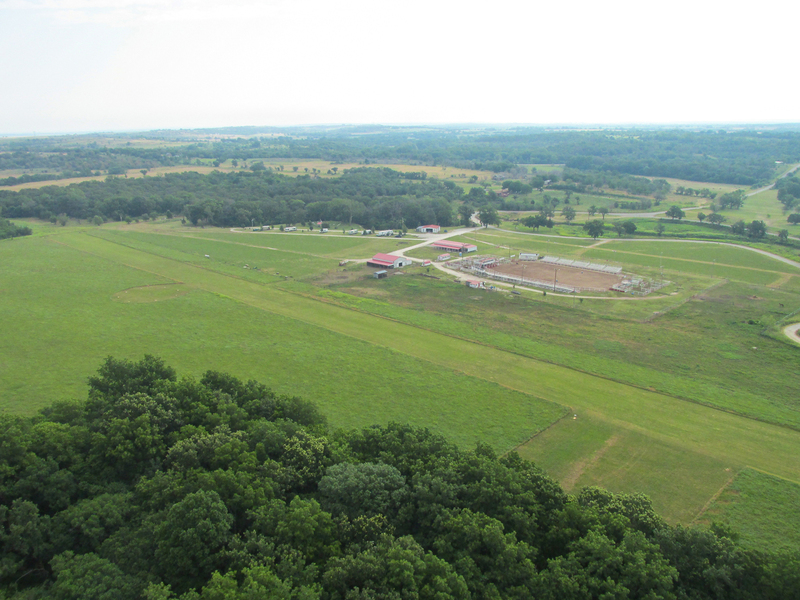 Selby Aerodrome and Stables from 400′ AGL looking South. The Quicksilver sits placidly out of the 35 mph wind blast. Lots of variety this flight. I hope you liked The Flight To Pawnee as much as I did. I grew up in Pawnee Ok. I enjoyed your tour. 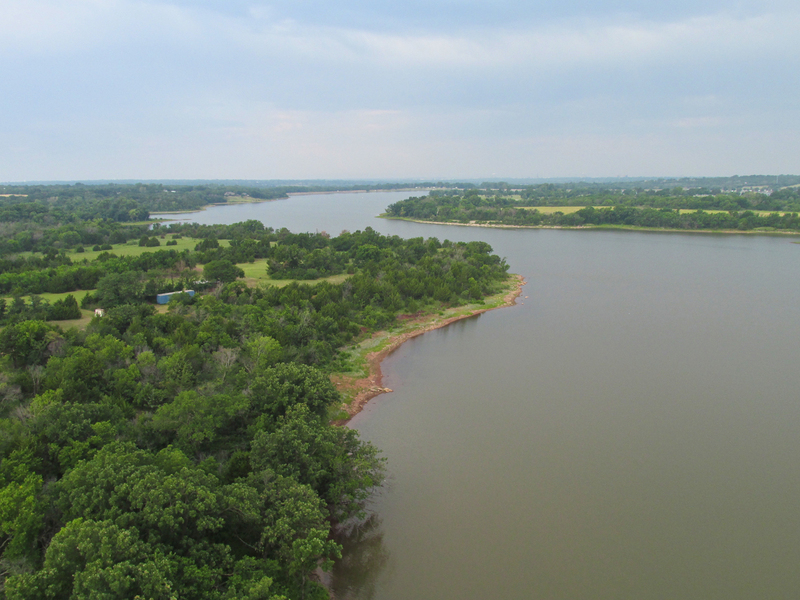 WE call the Arkansas River the R CAN SAW. I also helped build the new Arena. No hangars were hurt during the building of the Arena. WE did close the 13/31 runway which was never used and not even mowed anymore. The hangars had fallen into disarray and most had completely collapsed over the years and there was not even an ultralight based at the field anymore. Les is much more of a hero than he ever lets on. He was in the National Guard for years after the Wars with my Dad. Good to hear from you and for the clarifications. I am not completely surprised by your observation regarding Les Crocker. He reminded me of many unassuming types from the WWII generation who go quietly about their life not expecting or desiring attention.